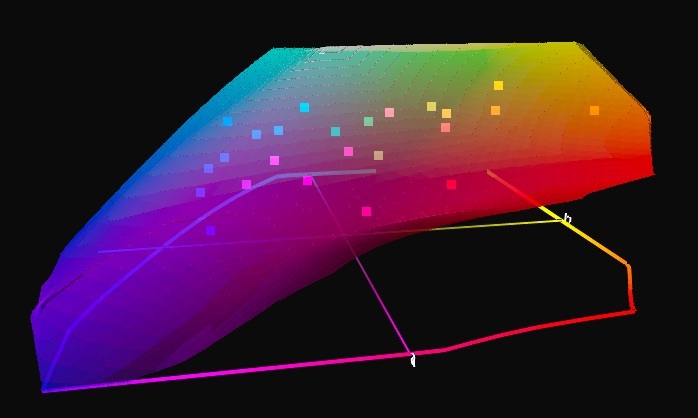 This article – exclusively downloadable from Luminous-Landscape – is an extensive excursion into scanner profiling, focusing on two products that came to market recently. 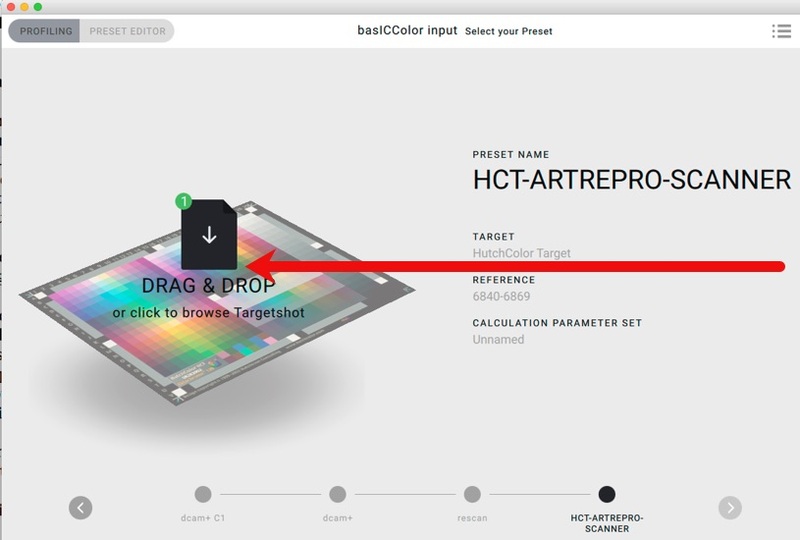 At about the same time that LaserSoft Imaging issued its Advanced scanner profiling targets, basICColor issued version 5 of its basICColor Input application, used for making scanner and digital camera profiles. These are two very different products purposed for different kinds of usage. The SilverFast Advanced targets are designed to be used within the SilverFast Ai8 application’s Auto IT8 scanner profiling function instead of the Standard targets previously (and still) available for this purpose. SilverFast Auto IT8 is a highly automated, seamless and easy way to create high-quality scanner profiles with essentially two button presses. Put the target in the scanner, call-up the Auto IT8 tool, start it, and everything else happens automatically under the hood delivering a very good profile. If you own a SilverFast Ai license, the only added cost is the target, and their pricing is toward the lower end of the range currently on the market. 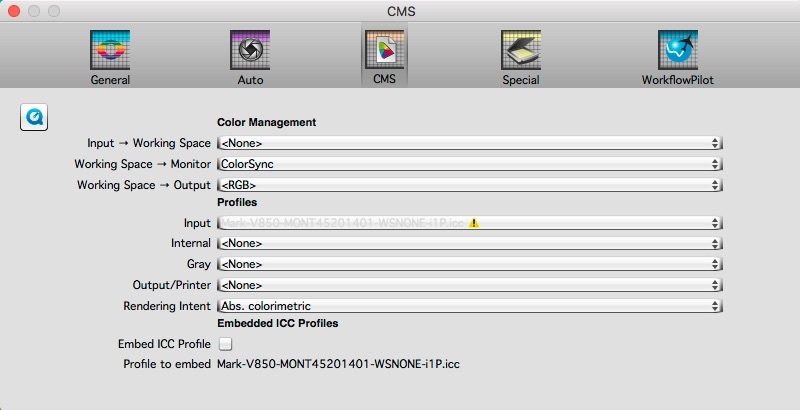 basICColor Input 5 is an altogether different product. It is a full-fledged stand-alone high-quality profiling application with a user-friendly interface for scanners and digital cameras, accepting a variety of different targets and capable of profiling pretty much any photo scanner or digital camera. It is a more hands-on approach, allowing, but not necessarily requiring, users to test various settings for making the profiles and providing scope to control the characteristics of the target image to be used for profile creation. This application, which has its own licensing cost (500 Euro at time of writing, excluding targets), will be of interest to users who either don’t use SilverFast Ai, or are looking for the scope to profile a number of different devices or try a variety of profiling parameters. One can of course cross-purpose. 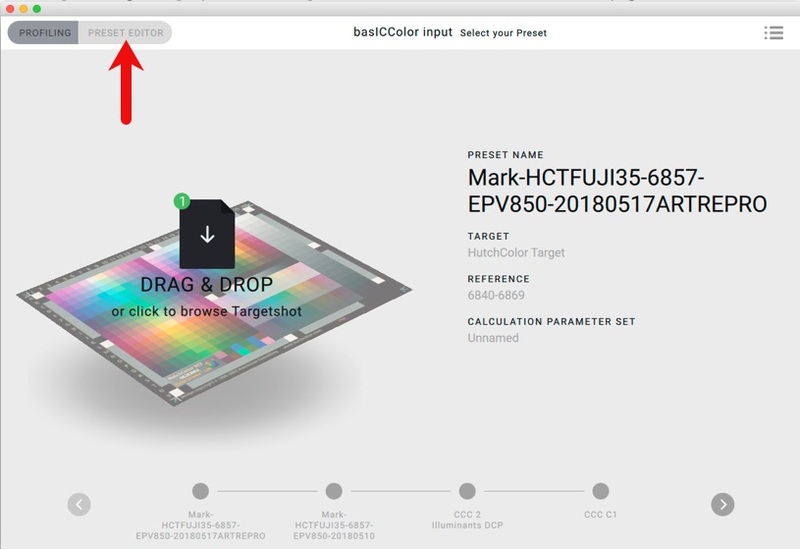 basICColor Input 5 is now equipped with presets for the new SilverFast Advanced targets, so one could buy these targets from LaserSoft Imaging and use them to create profiles in basICColor Input 5. 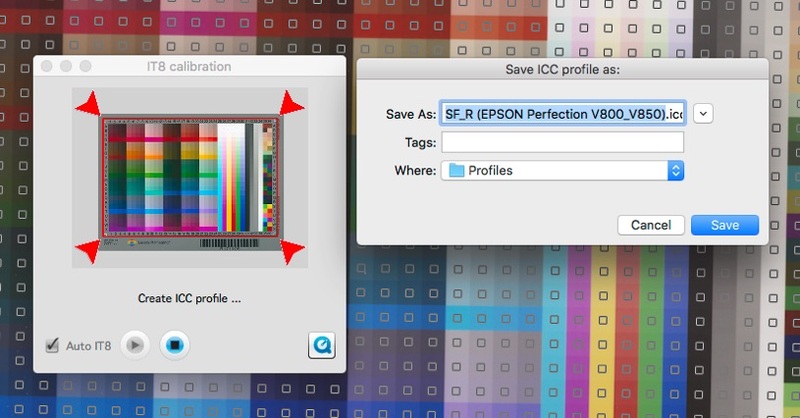 And of course, profiles created in basICColor Input 5 can be easily loaded into SilverFast’s colour management for use in scanning with SilverFast. 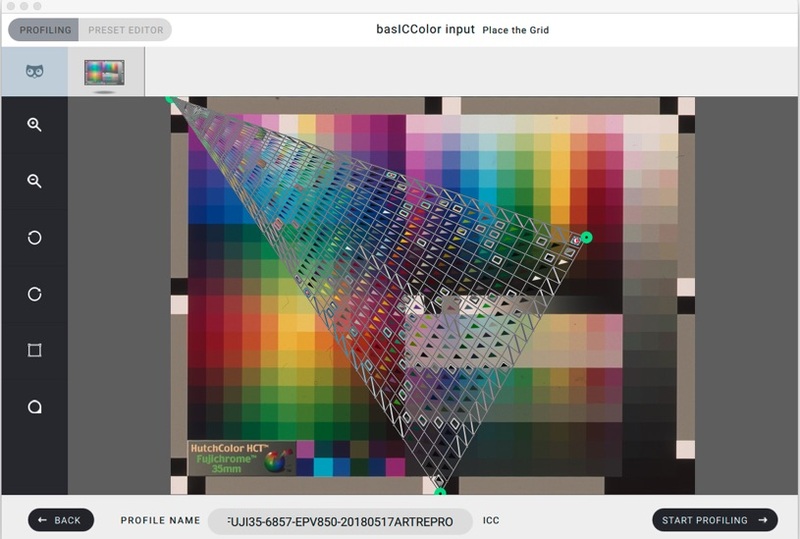 So depending on what users want to do and want to spend, there are options ranging from the easiest (just using SilverFast AI) to the more hands-on (using basICColor). The article begins with testing of the SilverFast Advanced profiling targets for making custom profiles (reflective and transmissive), looking at how they perform in their own right and relative to the SilverFast Standard targets and the profiles bundled with SilverFast (useful for those who don’t want to be bothered with custom-profiling their scanners altogether). Objective criteria are relied upon to both define and determine profile quality from these targets. 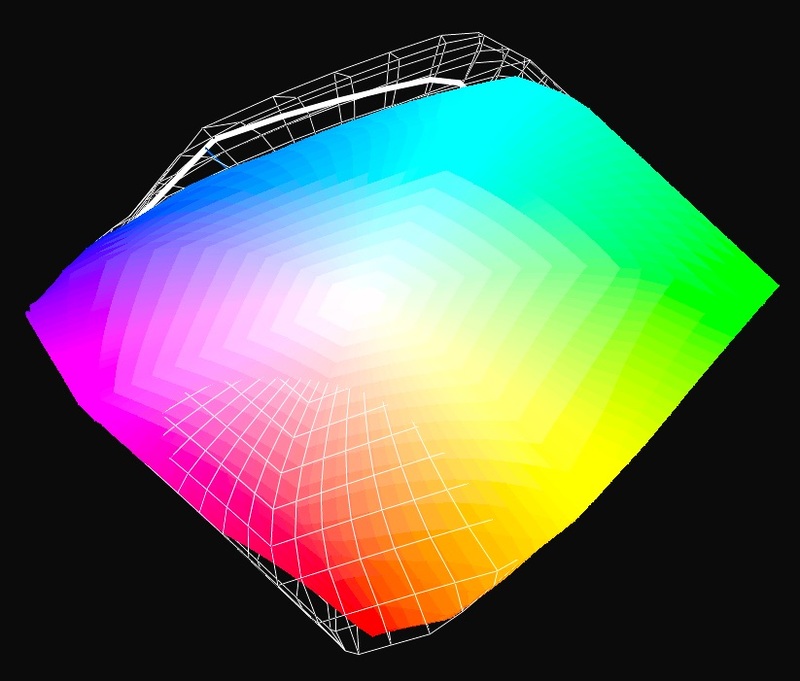 I also briefly take a second look at the X-Rite options for scanner profiling, then move on to a description and testing of profile making with basICColor Input 5 using Hutchcolor targets for transmissive profiles and LaserSoft Imaging Advanced targets for reflective profiles. 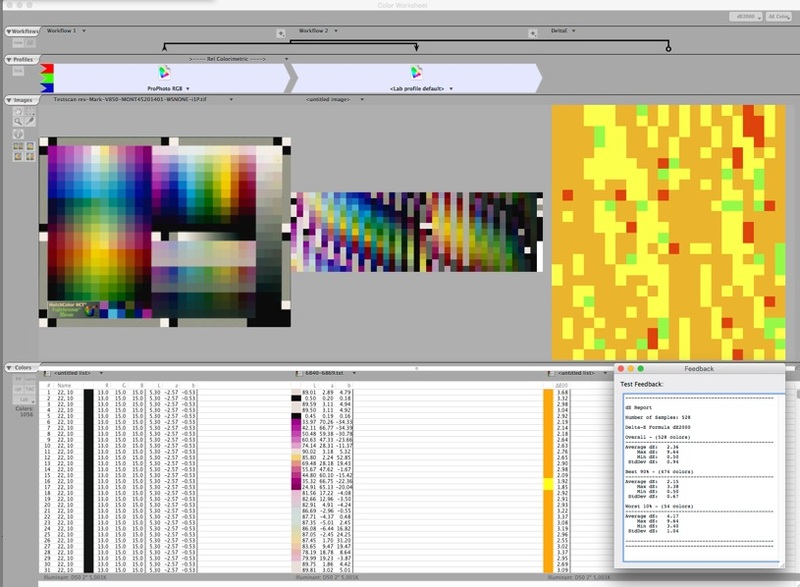 As discussed above, one of the main differences between the SilverFast and basICColor approaches to scanner profiling is that the former is a highly automated procedure usable with its own bar-coded targets and internal parameter set, while basICColor Input 5 is a more manual procedure that gives users more control over profiling parameters and choice of profiling targets from different providers – including Hutchcolor and LaserSoft Imaging, amongst others. Given the scope for creativity that the more manual approach allows, I developed some “gamma variants” designed to open shadow detail at the scan stage right from the profile, and I demonstrate in this article how to create them and what they do. 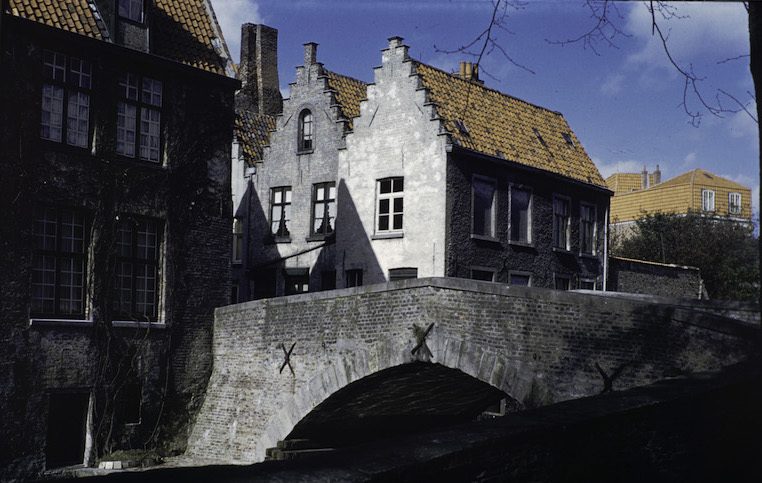 The image I featured in this demo is the one shown here, given that it’s one of the most challenging blocked-up Kodachrome slides (from the 1950s) that I still have, and it responded well to revealing “hidden” tonality. The article doesn’t take a position on which of these approaches is better than which – they both produce fine profiles; the choice depends mainly on user preference in respect to the profiling approach and the cost of the software and related materials. The article lays out the options, how they are implemented and what results they produce, as well as to explain the production and value of profile variants. As such, it provides a large amount of information readers may find helpful in determining the approach they should use for scanner profiling. 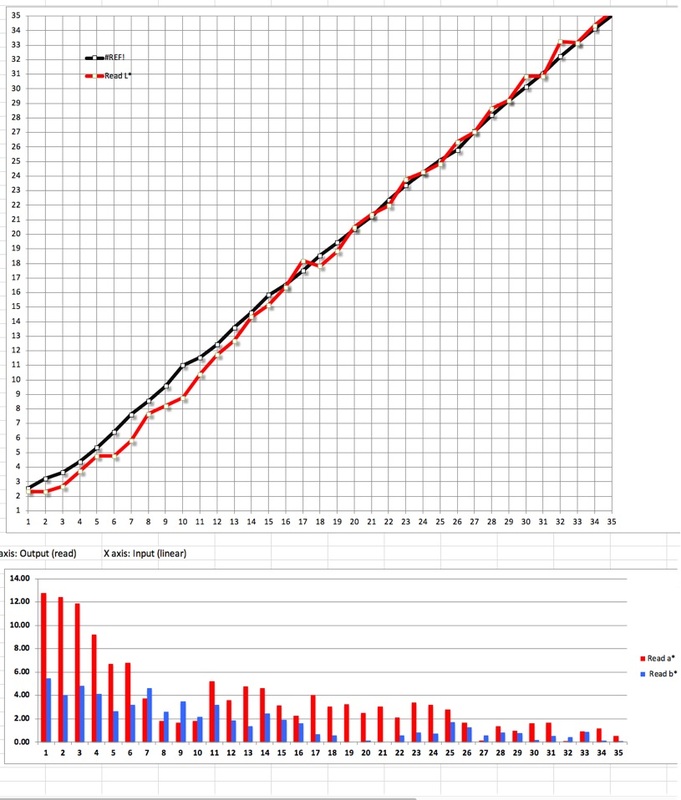 A couple of events motivated me to re-examine the making of scanner profiles. LaserSoft Imaging has produced a new set of scanner targets, called “Advanced” designed to work with their very easy and convenient Auto IT8 profiling procedure. 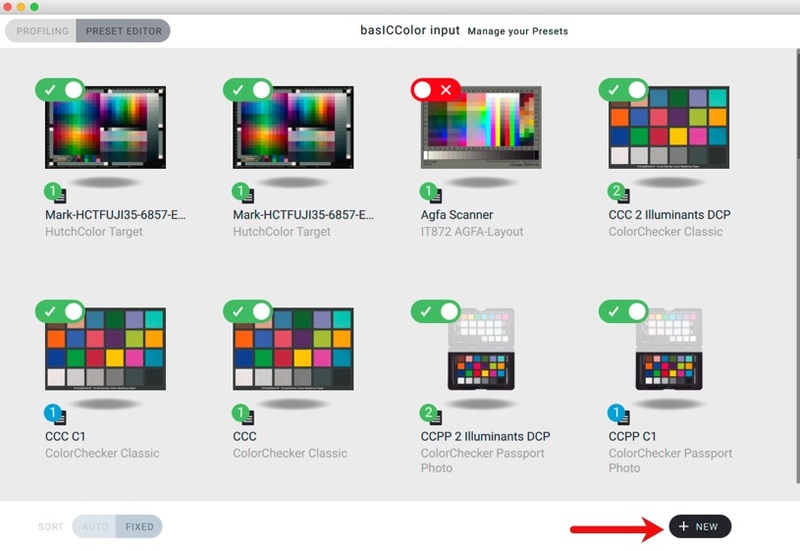 As well, basICColor has issued version 5 of basICColor Input, a versatile application for making scanner and camera profiles. These approaches are different in several important respects, so I thought it worthwhile demonstrating them in the same article. They are neither competitive nor complementary – each responds to a different way of handling scanner profiling that will appeal differently, depending on user requirements and preferences. In this article, I’m presenting alternative approaches to creating scanner profiles and evaluating aspects of the quality of the profiles they deliver. I’m focusing this discussion on the Epson Perfection V850 scanner because it’s a good quality scanner that I have, it accommodates both reflective and transmissive scanning, it is in current production and widely available. Readers may recall that I reviewed this scanner extensively on LuLa in February 2015. Based on many years’ experience, I expect that a scanner profile will not be good enough to completely avoid the need for some amount of post-scan image editing. Therefore, the most realistic objective is to produce a scan from the original media that will require only moderate post-scan editing to produce a satisfactory result. What is a “satisfactory result”? The digital image file (from an original paper photo or transparency) should have non-clipped highlights and shadows to the extent the original does not have clipped highlights and shadows, there should be no banding or posterization, the colour balance should be about right, and the image scan should be fairly open/flat, insofar as increasing contrast and vibrancy to taste can be much easier and produce more pleasing results than rescuing heavy, blocked-up quartertones or highlights. Recall, once a scan is made, if the resulting file is unworkable or requires major surgery impairing its potential quality, rescanning becomes necessary; with good profiling, this is an avoidable nuisance. These objectives and criteria run counter to a very common situation we face with original film media. Positive transparencies in particular often tend to be contrasty with dense quartertones from which it can be challenging to rescue pleasing shadow detail. The detail may well be present – looking at the slides under strong enough transmitted light reveals it, but scanning can easily fail to reveal it. 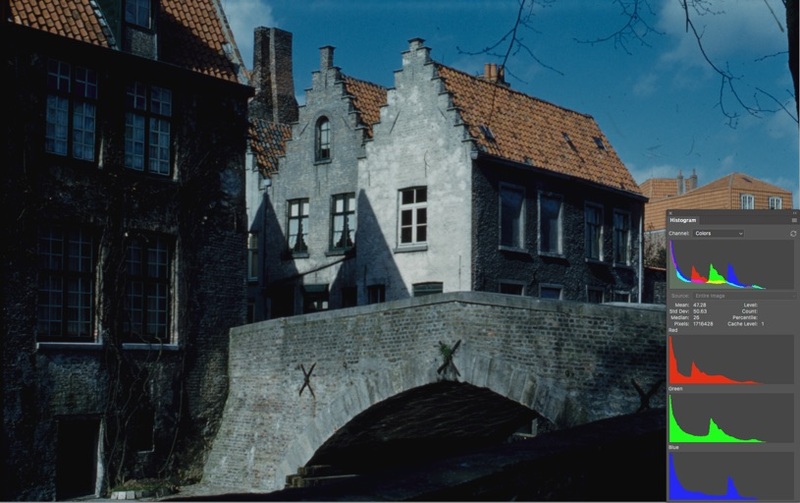 Depending on the film, the original images can also be excessively saturated or exhibit a colour cast either because it was built-in, such as with Kodachrome, or as a result of uneven dye fading. Hence, the interesting issue to resolve is that of the extent to which scanner profiling can bridge this often-contradictory situation whereby the photographic properties of the media and/or the scanner don’t automatically cohere with these criteria for a successful scan. As I’ve demonstrated in my e-book on scanning with SilverFast, there are often choices of whether to edit certain characteristics of the images in the scan software or in post-scan applications. Some issues are amenable to successful treatment in either, the role of the profile being to bring the image to a point beyond which only limited editing needs to be undertaken. So much to say that the profile doesn’t need to perfect an image, nor can it; but it should provide a workable scan. In this article, I’m demonstrating how the SilverFast and basICColor approaches help take us there. In the evaluations of profiling targets and scanning applications discussed here, I use accuracy testing as one benchmark for quality assessment. The general technique is to determine how closely a scan of a target with known reference values will reproduce those same values. There are different ways of approaching this kind of analysis and they do not necessarily give the same results. (i) the validity of results is limited to the patches being measured; (ii) a test that uses the same target for verification that was used to create the profile may deliver better results than a verification using a different target, and (iii) accuracy isn’t the only important criterion of profile quality – smoothness of tonal transitions is also important. Nonetheless, the dE evaluations remain useful for identifying any major problem areas on a product by product basis. Hence, I deploy these dE analysis techniques here, but caution to bear in mind the generic qualifications to how they should be understood. Regarding item (iii) just above, the accuracy of tonal rendition does materially help assure smoothness of tonal transition to the extent evident in the media being scanned, and it can be ascertained by testing the accuracy of Luminance scale scans. So, while I appreciate the advice in the book not to go there, I shall do so anyhow, but mindful of the caveats. I’ll start with this one, because it is by far the easiest and least expensive option for those who already own a SilverFast license, and perhaps also for those who don’t – but this option’s key advantage – automation – is only workable in SilverFast Ai, not SE or SE+. The price for SilverFast varies depending on the scanner model and one’s current SilverFast version. The new Advanced targets come in both Reflective and Transmissive formats. The reflective target (Figure 1) has 864 patches of which 96 are dedicated to the grayscale. The previous target has 288 patches of which 24 are grayscale. Hence the new target has a greatly increased number of patches, which depending on their design should produce higher quality scanner profiles. (Higher quality here means capable of more accurate scans, smoother tonal transitions, wider gamut.) I’ll be looking at that question. The software frames the target(s), makes the profile and tells you its accuracy; dE(2000) = 0.7 in Figure 3, which is excellent, but more on that below. The main difference for the Transmissive procedure with the Advanced targets is that it uses three slides also adding-up to 864 patches. For flat-bed scanners mount the three of them in the slide carrier. For film scanners, feed them one by one as instructed during the process, unless the scanner has an auto-feed mechanism allowing all three to be loaded at the same time, in which case do that. Then follow the on-screen prompts once you start the process. All of this couldn’t be easier. Turning to results for the Reflective profile I made for this article, the “dE” result mentioned in step 5 above is an accuracy test, checking the closeness of the scanned colour values of the patches in the profiling target relative to the target’s reference file values. The reported “0.7” means the average dE(2000) of all the patches in the target has a value of 0.7, which, if correct, is excellent. (Average results up to about dE 3.0 should be fine provided not many individual patches stray too far above this value.) SilverFast does not say which dE measure this is (I assume it is dE2000), nor does it provide measures of dispersion around the average or any dE detail for individual patches. While LaserSoft Imaging doesn’t explain how this internal test is implemented, I believe there is only one method of doing a “round-trip” internal to the profile creation process for measuring profile accuracy. The application comes stored with a reference file holding the correct L*a*b* values of each patch in the profiling target. When the profile is made, amongst other things, the scan of the target should record internally the scanned values of all those patches, which would usually vary from the reference file values. The internal test should compare the reference values with the scanned/profiled values of those patches, calculate the dE differences between them and take an average of all the dE differences. As for any average, there are values above and below the reported 0.7 average. 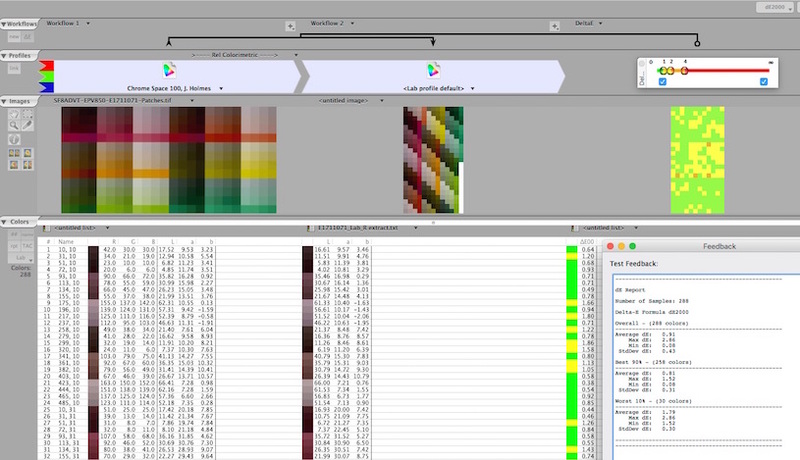 If we wish to have a more detailed, external check on the dE outcomes based on the results of actually scanning a reference image with the custom profile, it is necessary to use another application, in this case ColorThink Pro (CTP), which can implement the following procedure: (i) read the colour values of the patches in the profiling target reference file; (ii) extract the values of the patches from a user-triggered scan of the same profiling target done with the custom profile; (iii) compare the reference values of the target patches with the extracted values of the scanned patches and (iv) calculate the dE outcomes between the two sets of values. [It can also provide descriptions of the profile gamut and other useful information about the profile.] The supporting logic of this test procedure is that a good profile made from a set of known reference colours, should at least be able to reproduce those colours quite accurately when they are re-scanned using the custom profile they helped create and the settings of Figures 10 and 11 below. Let us begin this analysis with a look at the basic profile statistics for my reflective target profile as revealed by CTP (Figure 7): The gamut volume is very large at 2.3 million – not all that much less than ProPhoto at 2.5 million, but the shapes differ (Figures 8 and 9) between ProPhoto and “scanner space”. The neutrality and tonal range for the white and black points couldn’t be better. Turning to the detailed external accuracy test of the profile so created, the appropriate SilverFast Preferences settings for the General and CMS (colour management) tabs are in Figures 10 and 11. This is for making the test scan. Gamma is set at 2.2 by default in SilverFast (but variable), hence I surmise that scanned outcomes should be accurate relative to the media reference data for this Gamma setting. (The settings the Auto-IT8 process uses for reading the target(s) in order to create the profile in the first place are all “under-the-hood” and therefore not visible, but it is safe to presume they turn off all colour management and the profiles are created to work properly with the default 2.2 Gamma setting.) 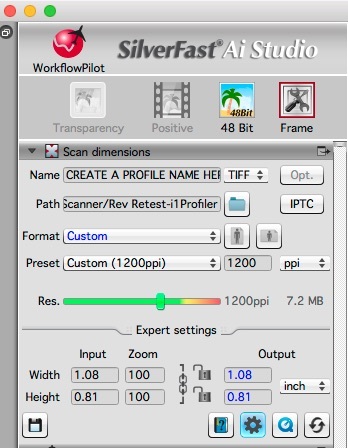 Figure 12 shows the scan set-up in SilverFast Ai 8. The target image is not edited – at all. Make sure Sharpening and all Auto corrections are off by default in Auto Preferences. Once the target is scanned as indicated, two files – the target reference file and the scanned image of the same target – are brought into CTP from which the detailed dE(2000) outcomes are computed (Figure 13). The dE diagram at the far right of Figure 13 is an immediately revealing snapshot of the dE range across the patches. The green patches have dE less than1.0 (excellent). The yellow patches have dE between 1.0 and 2.0 (very good). The orange patches have dE between 2.0 and 4.0 (fair). The red patches have dE greater than 4.0 (poor). Notice there are only four red patches. Yellow predominates, with green and orange both having a substantial presence. The Feedback Report (Figure 14) shows the results numerically. 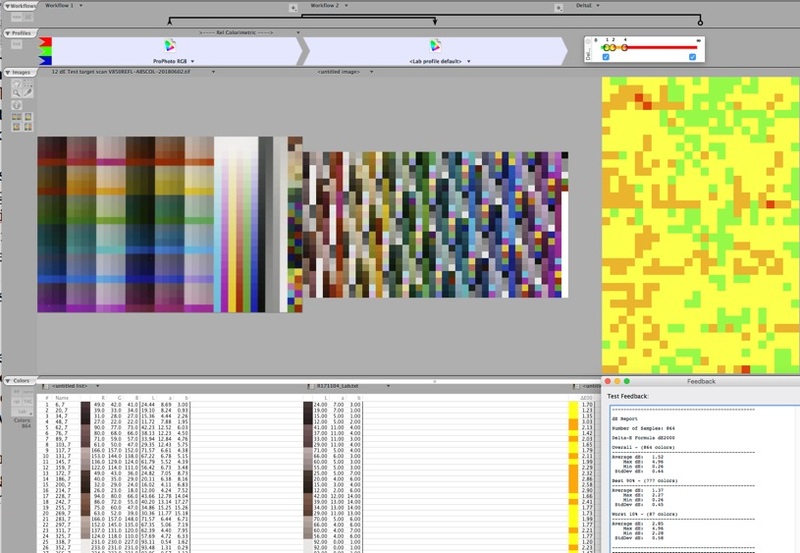 The lists below the target image allows one to compare reference values with results values for each of the 864 patches. Detail is often useful for analysis of problems, and there we have it. With an Average dE of 1.52 and no patch higher than 4.96, this is indeed a very good profile. This dE(2000) result of 1.52 is a bit more than twice that from the SilverFast internal verification discussed above. I’m not concerned about this – the procedures and applications used for these verifications are different, so some difference of results is unsurprising. Both tell essentially the same story – the reflective scans made with this profile should replicate the original media (photos or plain paper) well, and they generally do. I can’t show you originals over the Internet, but I can scan an object that has excellent memory colours and let you see for yourself whether the scan is faithful to your memory. Most of us have probably felt stupid enough in the past to buy a “For Dummies” book on one subject or another, and the whole series has a familiar colour scheme of yellow/green/black/red covers. 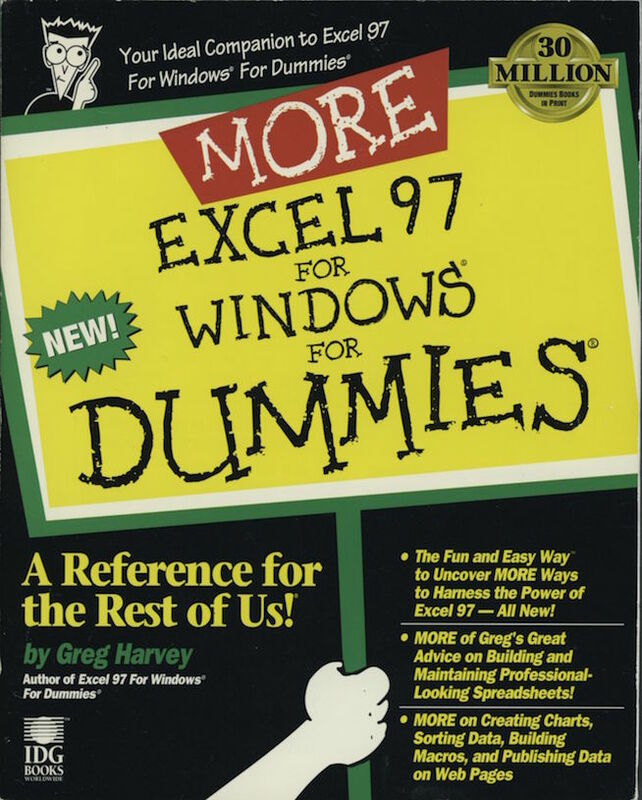 Therefore, I scanned (and left unedited) the front cover of my copy of “More Excel for Dummies” (Figure 15 – now you know partly how I learned to make all those spreadsheets I use in my digital imaging analyses! J). You may agree that the apparent closeness of the match between the scan and the original is remarkable. A more scientific approach for re-verifying whether the scan is faithful to the original media is to scan a totally different target that has patches with known, measured reference colour values and compare those values with the values of the patches in the scanned derivative. I did this by reverting to the prints of targets that I generated for the printer paper/profiling evaluation approach I demonstrated in my recent LuLa article on extended printer accuracy stress testing because I have the printed test targets and the read values of all the patches in those prints. I can scan such a print with my new custom profile, and then use CTP to extract the colour values of the scanned patches, then compare them with the original read values of those printed patches by calculating the dE between the two streams of patch values. The target I used is my Gamut Boundary-High Saturation 24 patch set that I generated for testing the gamut boundary values of my (wide gamut) Epson SC- P5000 printer/IGFS profile (Figure 16) (Please see my LuLa article on Printer Stress Testing for more information about how I developed this target.) 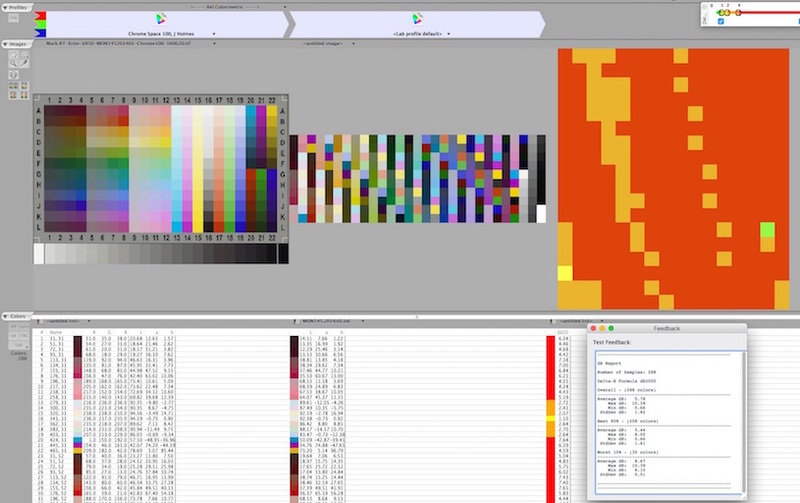 Figure 17 shows how the colour values of those 24 patches fit within the gamut of the scanner profile being tested. No issues. It’s all safely in-gamut. 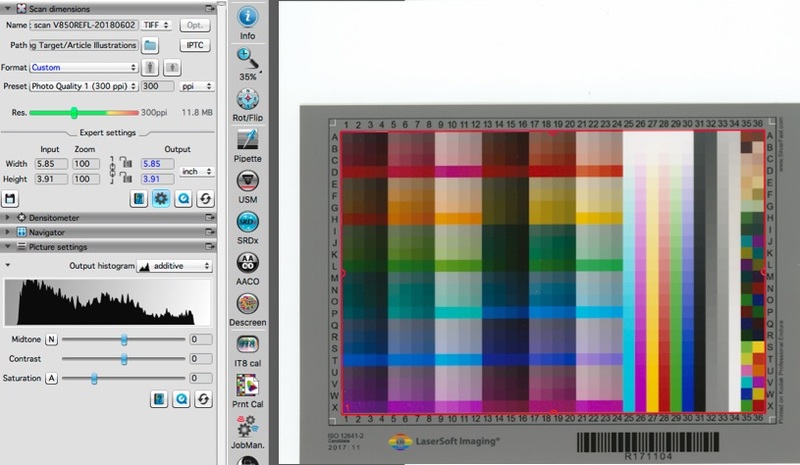 Figure 18 shows the colour management settings in SilverFast for making the scan. Figure 19 shows the results. 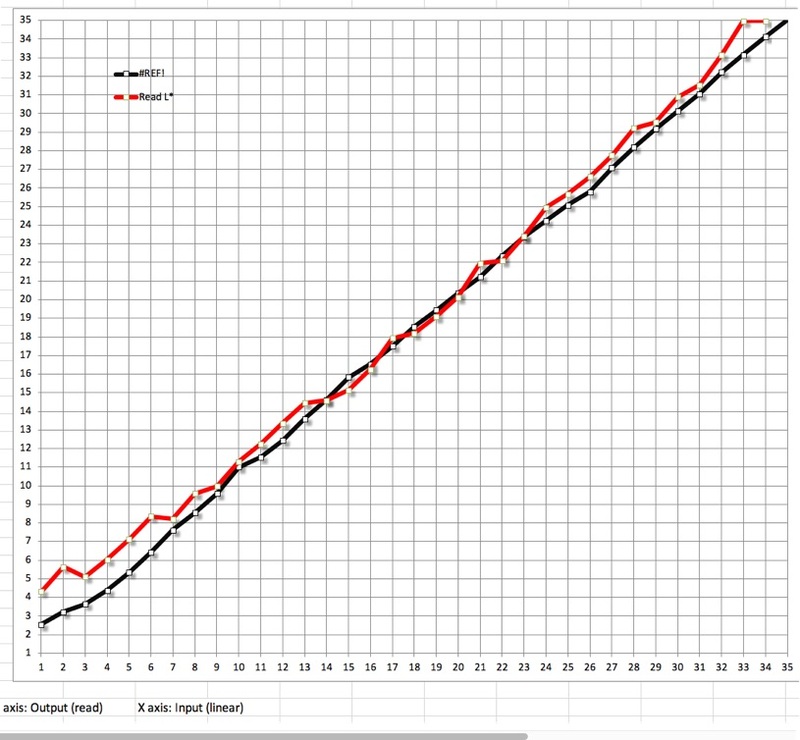 The average dE is 2.15 – not a bad outcome, the lowest dE being 0.52 and the highest at 3.96. One may ponder why the dE result for this target shows higher dE than did the scan of the profiling target (dE=1.5). 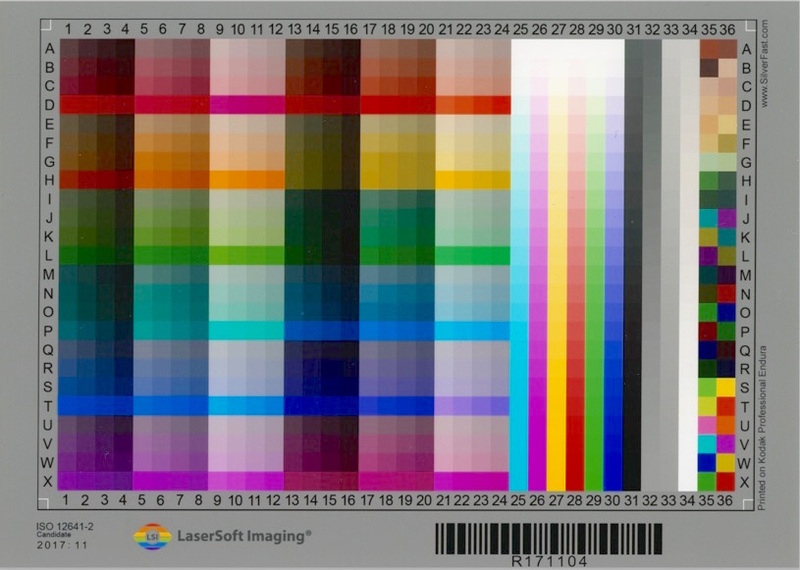 It may be on account of the different spectral properties of the media being scanned – the scanner target being glossy, while the Gamut Boundary-High Saturation patches are on luster paper. Or, notwithstanding that all the colours are in gamut, perhaps the scanner simply has more trouble replicating some of the more intense colours in the high-saturation target. Or perhaps 24 values is not a large enough number to dilute the impact on the average of any outlier values. As users may be scanning B&W prints, I thought it useful to examine how the custom profile may perform rendering grayscale. This test also indicates whether to expect smooth tonal gradations in the scans made with the profile being tested. So I scanned the three pages of B&W patches (every level from L*1 to L*100) making up my extended B&W accuracy test (discussed in my above-referenced article, and my article on Expanded neutrals Testing) in this case for the Epson SC-P5000 printer and Ilford Gold Fibre Silk paper (Baryta-base luster); to remind, the Dark scale in this target goes from L*1 to 35; the Mid-tone scale from L*36 to 70 and the Light scale from L*71 to 100. 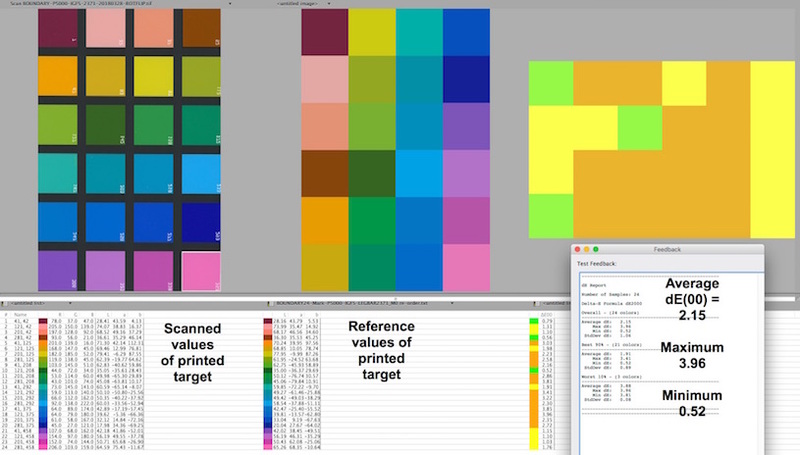 I brought the scans of the prints into CTP, which application extracts the scanned values of the patches and I export them as a color list that I import into my Excel templates of the test sheets for comparison with their reference values. To be clear about what’s being compared: the read values of the patches printed on paper are compared with the scanned values of those same patches and differences between the two sets of values are noted. In this way, the differences are only between the Lab values of those patches as printed on paper on the one hand versus the scanned values of the corresponding patches from the scan of the paper prints. These differences are not dE calculations for the patch as a whole. Rather they are absolute differences for each of the L*, a* and b* channels independently, allowing me to separately evaluate the linearity of tonal transition up the grayscale one L* value at a time on the one hand, and its neutrality on the other. The linearity of the printed tonal scale and the neutrality of the patches are very good in these targets, so they are a useful basis from which to assess the tonal and hue values that result from scanning them. Figures 20 to 25 inclusive show the results of this test from the scanner. Looking first at the Dark portion, tonal scale (Figure 20), the Blackline tracks the read values embedded in the target print (they were read with an i1Pro2 in i1Profiler). The Redline tracks the values that CTP pulled from the scan of that target print. If the scan were a perfectly faithful replica of the media scanned, the two lines would converge exactly. This never happens, but as long as the departures aren’t very large – say no more than 2 levels apart – the differences could be largely imperceptible, especially at the dark end of the scale. The hue cast (Figure 21) is somewhat concerning especially in the a* channel (Magenta-Green) with departures approaching 5 levels (the underlying numbers showing it to be a green bias). The b* channel is closer to neutral, variances ranging up to 3 levels from their reference values, but many at 2 or less variance from reference values. Most of the b* variances are bluish. Hence, all told, the scan has a moderate Cyan bias by the numbers; not being dE(2000) calculations, these numbers may not faithfully indicate how perceptible the variations from strict neutrality really are, here or in the following similar graphs; but regardless of the measurement approach, the smaller the variations the better. Turning to the mid-tone scan, the linearity of the tonal scale is good in the sense that the curve is not jumping about (Figure 22), however, it is persistently about two levels above its reference values. 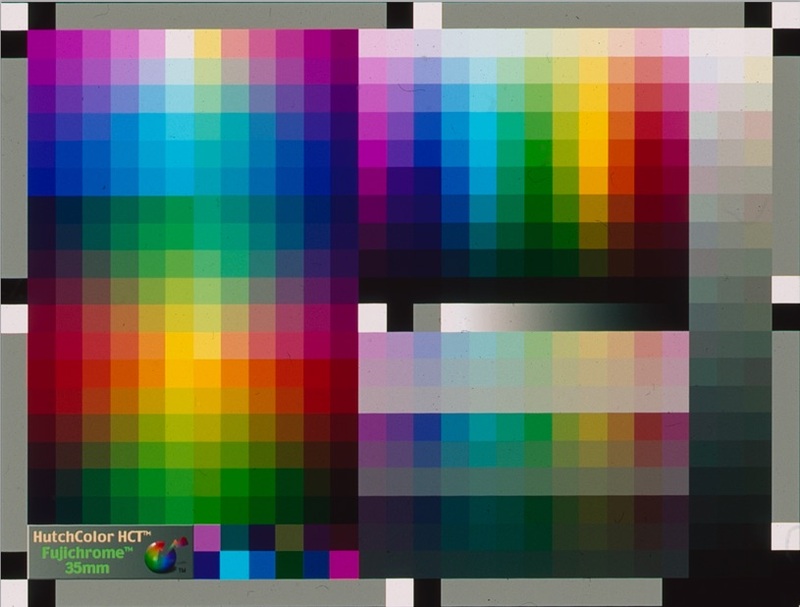 The hue bias (Figure 23) is less than for the Dark tones, however about a third of them are reaching toward 3 levels variation in the a* channel. B* variation is lower. The scan of the bright tones (Figures 24 and 25) indicates reasonable linearity of the tonal range up to level 94, flattening thereafter, but with variation up to +3 levels from their reference values. The hue biases are much less marked in this region of the scale compared with the two darker ones. On the whole, the B&W test deserves a pass, but it would be good to have a better understanding of the colour cast and the exaggerated luminance of the mid-tones and light-tones; one possible cause is scanner flare that doesn’t get fully compensated by profiling – a good place to mention that when scanning, any areas external to the scan media image should be masked off with black paper to minimize flare. That said, the linearity of the tone ramp is more important to the smoothness of tonal gradation than whether the overall tonality is a bit brighter or darker than it ideally should be. Brightness is easy to correct in a post-scan workflow, but linearity is not, and it is quite well respected in these tests. People who already own the Standard target set may be wondering whether it’s worth buying the new Advanced set. Therefore, I had a look at how it compares with the “Advanced” target. Recall this target has far fewer patches, including grayscale ones, than does the Advanced target. 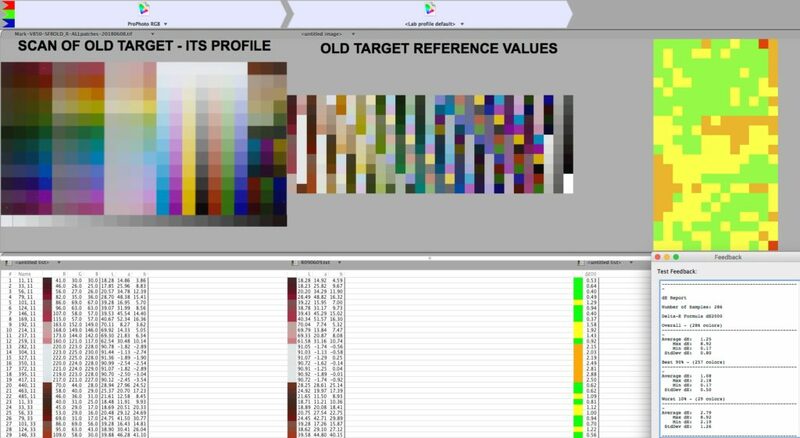 The procedure is similar to that above: make a profile with the old target using the SF8 IT8Cal function, test the new profile using as scan media both the target used to create the profile and my own separate test targets for colour and grayscale rendition. After triggering the IT8Cal function, SilverFast indicates that the profile is completed with a dE of 0.7 (same as for the Advanced target) (Figure 26). Examining the profile basic statistics in CTP, the gamut volume at 2.2 million is very similar to that of the Advanced profile. Black point neutrality is excellent. White point neutrality shows a hue bias of b* = 6 (yellowish), which is less neutral than for the Advanced target. 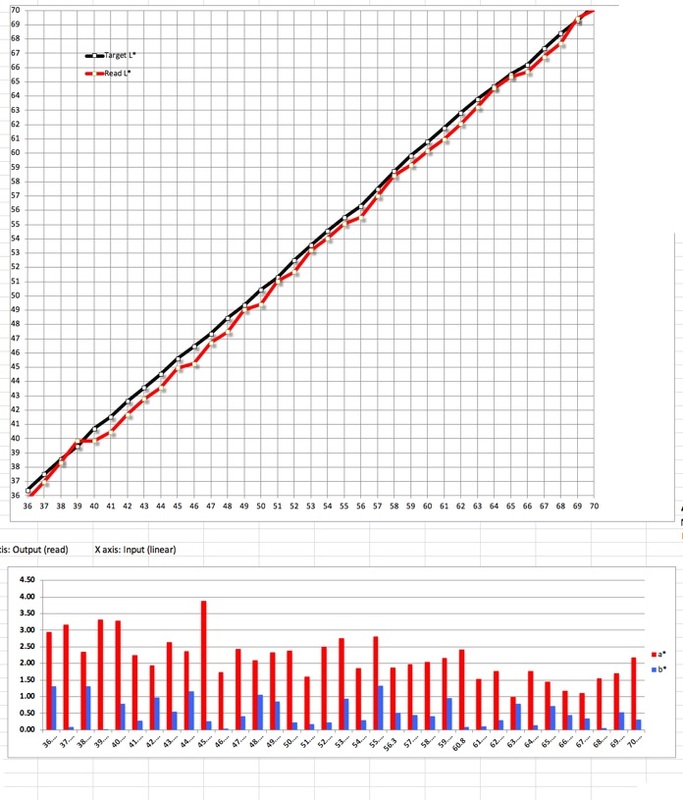 Performing the round-trip test in CTP (scanning the target used for making the profile and comparing the colour values of its scanned patches with those of its reference file), the average dE is 1.25, compared with 1.52 for the Advanced target, indicating that for this test the old target produced a very slightly more accurate profile than the new one, but I wouldn’t consider this difference to be meaningful (Figure 27). I then implemented my high-saturation 24-colour test, scanning the same target of Figure 19 but this time with the profile created from the Standard SilverFast target. 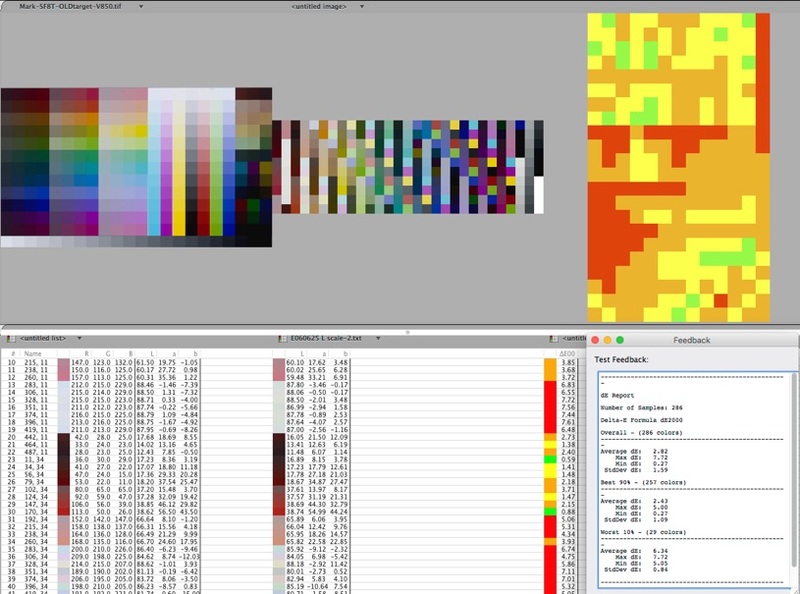 Figure 28 shows that all 24 patches are well within the colour gamut of this profile. The CTP analysis (Figure 29) shows the average dE of this scan to be 2.30, very mildly higher than the 2.15 shown for the Advanced target, again not a meaningful difference. 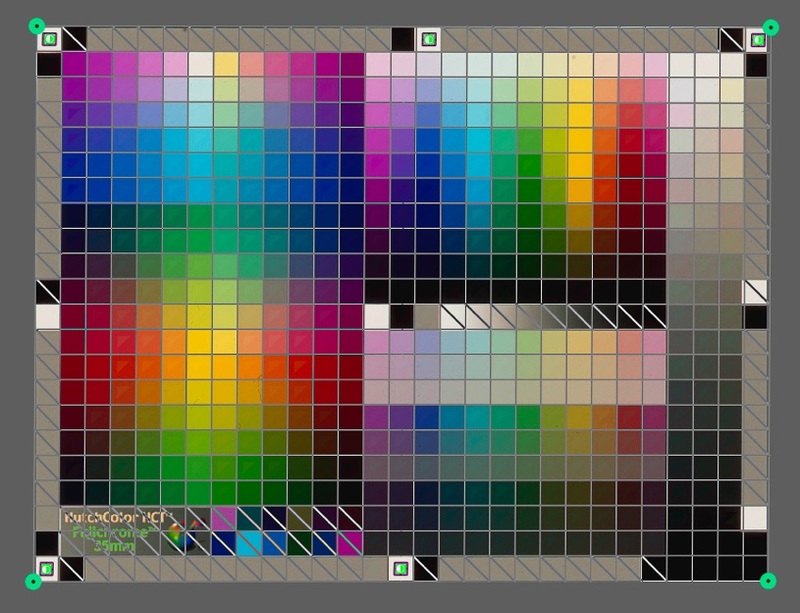 The 100-patch grayscale evaluation tells different stories depending on whether the luminance range being measured is in the Dark tones, Mid-tones or Light tones. For the Dark tones (L*1 to 35), Figure 30 shows more discontinuity in the tone scale than I would have preferred, with notable discontinuities at levels 2, 4, 9, 14 and 19. That said, the overall average variation from reference values is only 0.74 with a maximum variation of 4 and a minimum of 0.02. The hue bias (Figure 31) is rather more noticeable with many of the patches having a* variation reaching a*5 or more, all of it greenish, while the lesser b* variation is bluish, resulting in a slight cyan cast. For the Mid-tones (L*36 to 70), Figure 32 shows a near convergence between the scanned values and the reference values for the luminance scale, the average variation being only 0.4 levels. 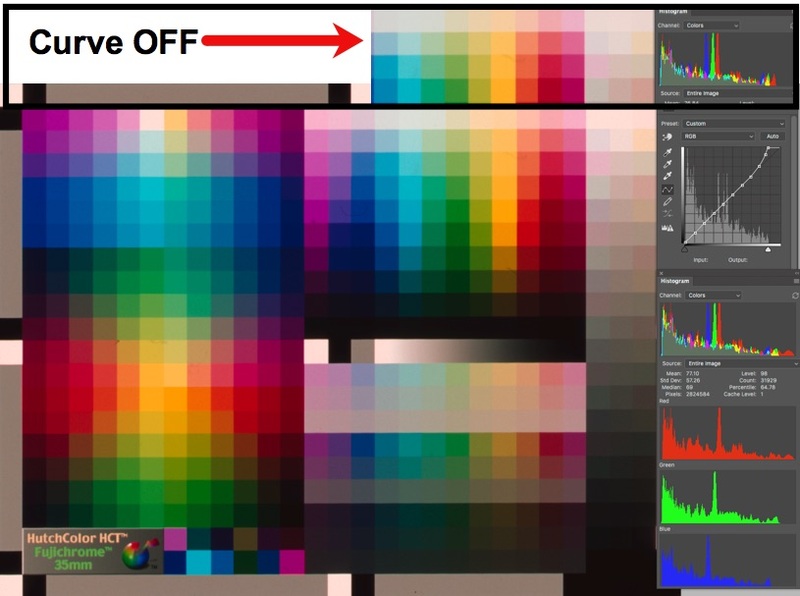 Figure 33 indicates less of a hue bias than observed for the Dark tones. Most of the variations are below 3 levels in both the a* and b* channels, the averages being 2.6 and 2.4 respectively. For the Light tones (L*71 to 100), the luminance range (Figure 34) shows very good closeness of fit between the reference values and the scanned values, the average variation being 0.96. For the colour scales (Figure 35), most of the a* readings show variation below 2.0, while quite a few of the b* readings show variation between 3 and 5, the averages being 1.2 and 3.3 respectively. The variations are almost all biased to Cyan. Comparing with the darker parts of the scale, one must observe that there is hue inconstancy of these supposed “neutrals” as one progresses up the scale. Figure 36 summarizes the comparison between the advanced target and the Standard one. By looking these figures over, I don’t see a clear, unequivocal winner between the two. Which to use would depend on which parameter of accuracy is more important to you. Taking these comparisons one step further, I thought it interesting to ask what would be the case if one made no custom profiles and rather relied on the supplied profile for this scanner which LaserSoft Imaging provides free of charge bundled in SilverFast. The SilverFast supplied profiles load into your Profiles folder when you install the application. Not knowing exactly what reference values to use for whatever target they used to create their profiles, I did not round-trip any scanner target but tested my own targets (the ones above – High Saturation colours and B&W scale) for which I know the reference values of the prints. The results of these tests are listed in the “Generic” column of Figure 36. Frankly, these results are either better than, or no worse than or imperceptibly worse than anything achieved with the custom profiles. At least for this scanner’s reflective scanning, admittedly a sample of one, it does query the value-added of custom profiling, but also reconfirms the intrinsic quality of what SilverFast is providing, and perhaps also the consistency of the V850 scanner from unit to unit. 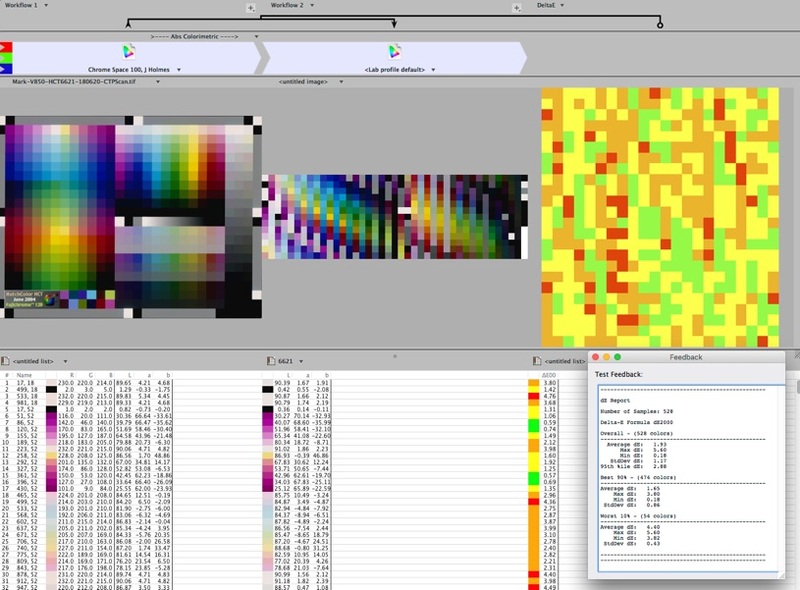 This ends the analysis of reflective scanning profiles made in SilverFast. This discussion can be briefer than that above for the reflective target, as the evaluation methodologies are the same. As well, I do not have slides portraying the kind of B&W targets needed for detailed grayscale evaluation as done above, hence grayscale is part of the evaluation done from the profiling targets. Transmissive targets are used to make profiles for scanning positive transparencies. As mentioned above, the new SilverFast Advanced target is a set of three transparencies holding a total of 864 patches (288*3) – about three times the patch count of the Standard target. 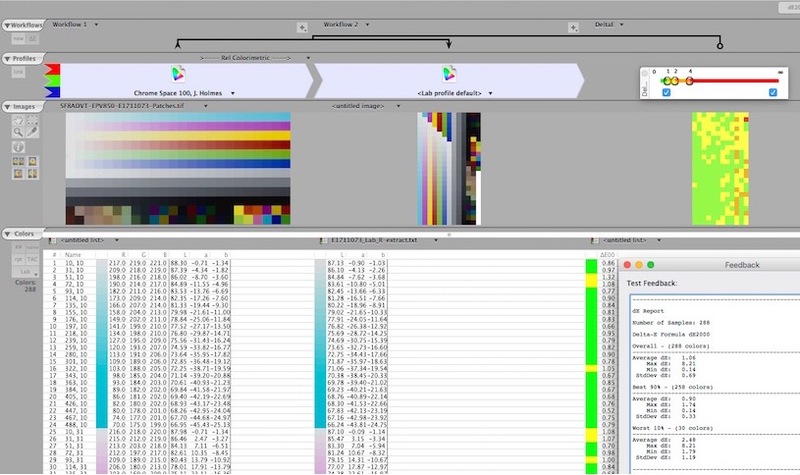 In this section, I shall examine the performance of a profile from this target in relation to one generated from the SilverFast Standard IT8 target, the generic transmissive profile bundled with the application, and a profile generated from X-Rite i1Profiler. Profile making with the transmissive target is the same process as described for the reflective target. 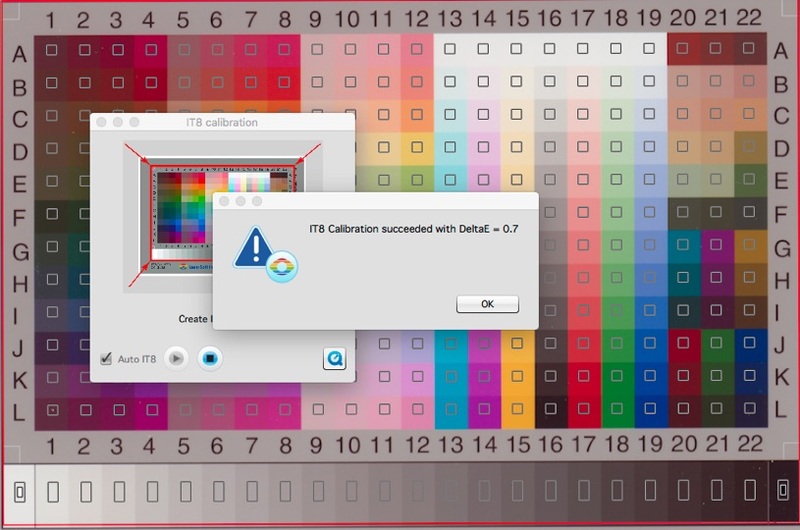 In IT8Cal one selects the Advanced option and the application does the rest, producing a dE result of 0.7, identical to that of all other SilverFast profiling processes examined above. This constancy of the dE outcome from within the application is unusual for multiple profile creation processes, wherein one usually sees variation from one profile creation to another; as well, externally generated tests relative to the target reference files do not create uniform dE results, at least for me, as we’ll see below. Absent knowing why all these internal evaluation results come out at 0.7, I would focus at least as much on the external test results, using CTP. As with the reflective target, this one generates a wide gamut profile of 2.3 million. The white and black point properties are excellent, running the full scale from 100 to zero respectively and neutrality is fine, the white point having a* and b* values of 1.0, and the black point being fully neutral for both a* and b*. For reasons described in his article about the appropriateness of its design for film scanning (https://www.josephholmes.com/profiles/rgb-working-spaces), I have adopted Joe Holmes Chrome Space 100 (HCS100 for short) as the working space for transparent media. 857 patches of the 864 in the SF Advanced target fit within HCS100 gamut. The seven that don’t are very close to the gamut boundary (Figures 37 and 38) and have a negligible impact on accuracy tests. the new profile in scans of the targets used for creating that profile, extract the scanned patch values using CTP and compare them in CTP with the reference file values for those patches, then seeing the dE results both visually and using the dE Report generator. The main difference for this particular transmissive test is that it is done separately for the three transparencies making up the one target, insofar as the scan of each transparency is fed into CTP for extracting its patch values. I extracted the corresponding reference values for each slide from the single “.txt” target reference file that LaserSoft Imaging provides covering the three slides. Figures 39 to 42 show the results of applying this test. The results are generally excellent, the averages being below 1.0 for slides 1 and 2, and the maximums of less than 3.0. For slide 3 the average is just slightly higher at 1.06, which is still excellent, but the maximum of 8.2 sticks out. This outcome is for a single purple patch, within gamut, the main problems being that the scan largely understated its Luminance and overstated its b* value. I have no idea why. Apart from this, the overall results are fine. 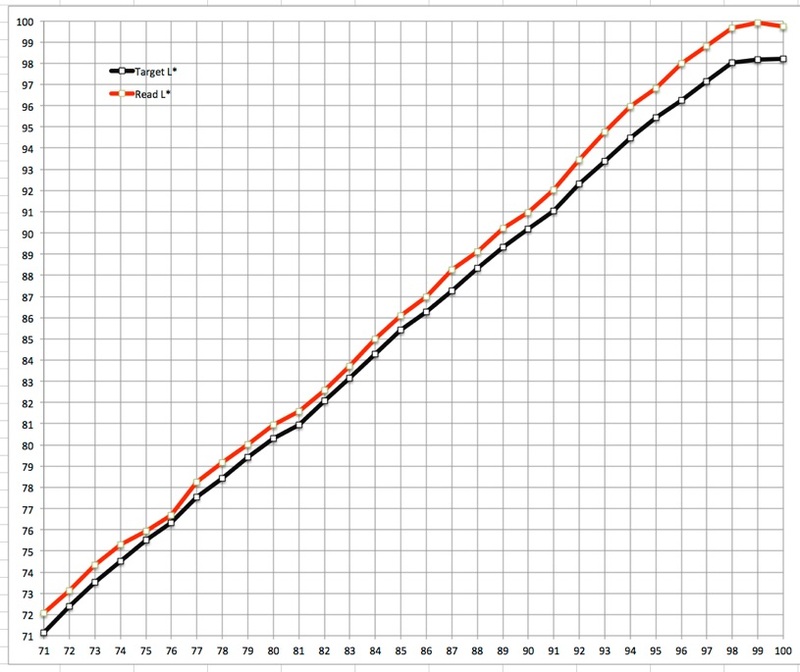 For 90% of the patches in target 3 (257 out of 288), the average dE is 0.9 and the maximum only 1.74. On the whole, the Advanced target and the Auto profiling process perform well in these tests. Turning to the Standard IT8 transmissive target, it too has a very wide gamut volume at some 2.2 million. Its tonal range is L* 0 to 99 and its White and Black points are neutral. However, the profile made from this target did not perform as well in the accuracy test as did that from the Advanced target. Its average dE is 2.82, with about 50 patches showing dE > 4 (Figure 43). 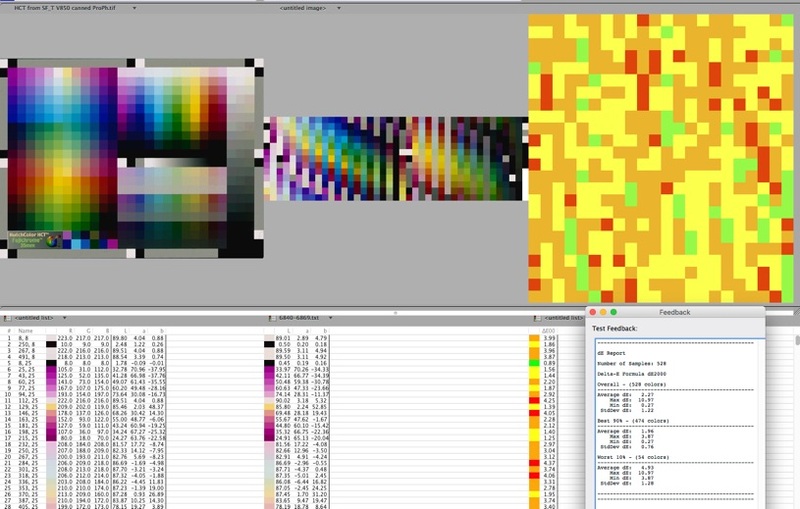 Examining a large sample of patches having dE>4, the Luminance channel performed well, but the scan quite systematically over-estimated the b* channel (values more saturated than the reference values) and under-estimated the a* channel (values less saturated than the reference values) enough to create these high dE results. My old SilverFast IT8 target dates from 2006 but kept in moderate climate and dark storage, so it’s not clear whether the problem is deterioration of the target or something else. 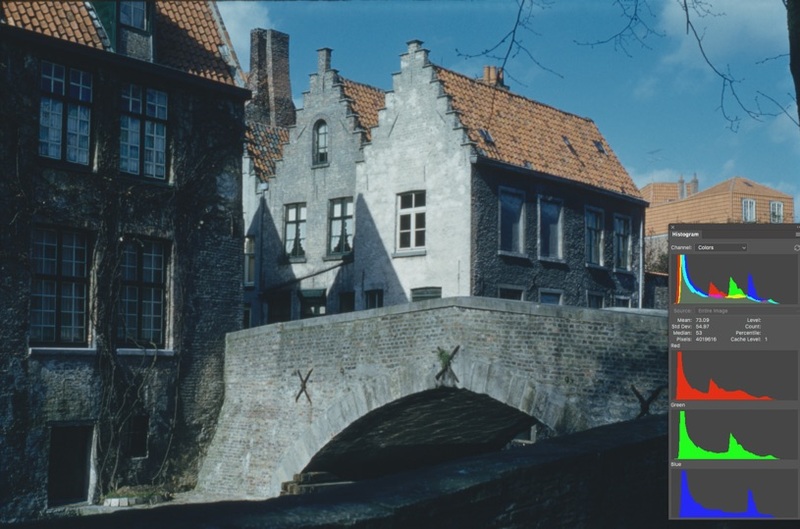 It was printed on Fuji Provia professional film which should retain its dyes well in dark storage and moderate climate over the 12 years since it was manufactured. 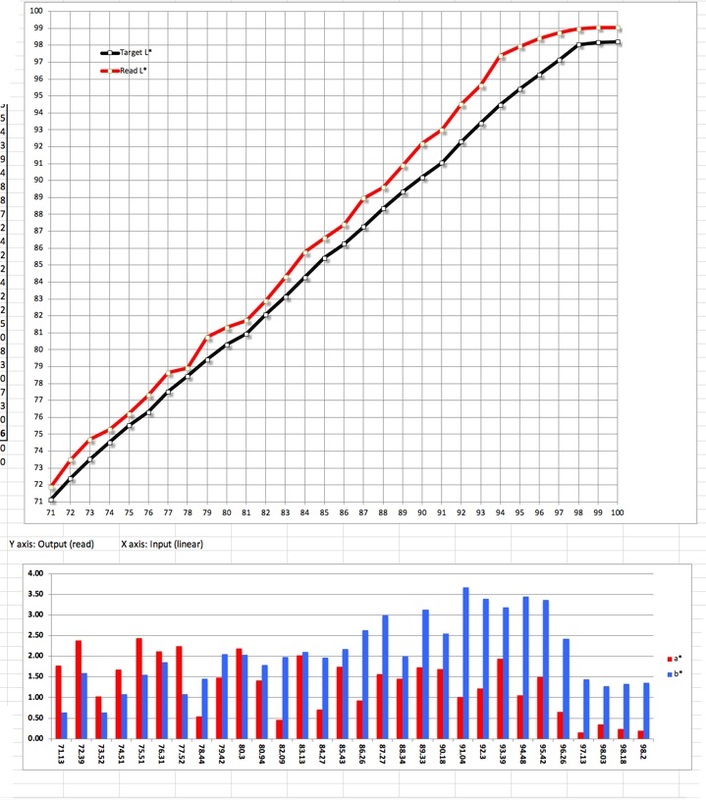 Bottom line – between the new Advanced and the older Standard transmissive targets, the evidence points to a substantial improvement of statistical accuracy with the Advanced target. But I caution that both are a sample of one. In case my Standard SilverFast IT8 target deteriorated affecting the quality of my custom profile, I thought it worthwhile to try scanning another target altogether (the Hutchcolor target, Figure 44) that I know is in good shape and for which I have the reference file values, but this time using the SilverFast supplied profile (the one that LSI made and comes bundled with SilverFast); it predates the new Advanced targets by some years, hence most likely was made from a version of the SilverFast Standard IT8 target. 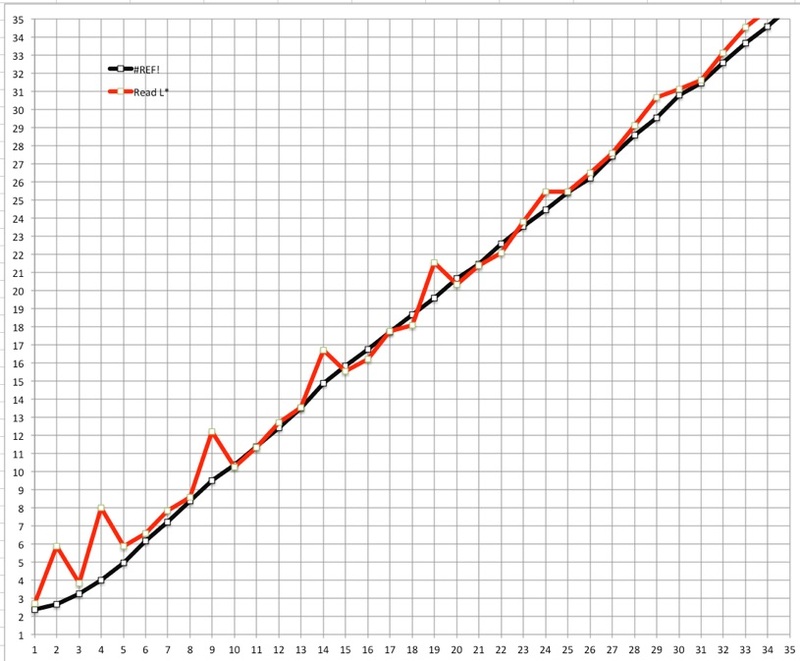 The average dE is 2.27 (Figure 45), maximum for one patch almost 11. This tells me that the reason for relatively sub-optimal results from the profile made with the Standard IT8 target is most probably related to its own generic limitations, not necessarily deterioration of my target slide, and once again suggests the relative merits of creating a transparency profile using the new Advanced target. Any alternative to the highly automated, and successful, SilverFast IT8Cal process will be more work to implement. The upside, however, is that it opens up creative possibilities to craft the profiles for specific purposes without needing to use profile editing software (hard to find these days and not easy to use). 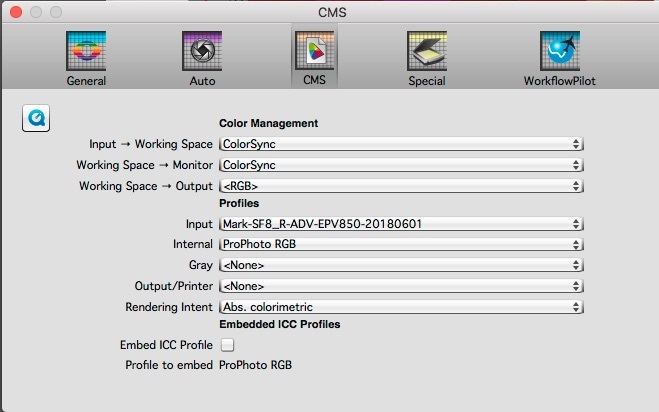 I shall explore creative options in my discussion of using basICColor Input 5 (BCI) for making scanner profiles. Before getting into BCI, the first alternative I’ll briefly cover here is to use X-Rite’s i1Scanner, especially if the scanner came bundled with X-Rite targets and the X-Rite i1Scanner profiling software. I tested this approach in my review of the Epson V850 scanner and found that it is a cumbersome and convoluted 20-step procedure. I had the profile resulting from my review of the Epson V850 scanner, so I called it up to test its accuracy for this article. The gamut volume, White Point and Black point data are all very similar to that achieved with either of the SilverFast options. 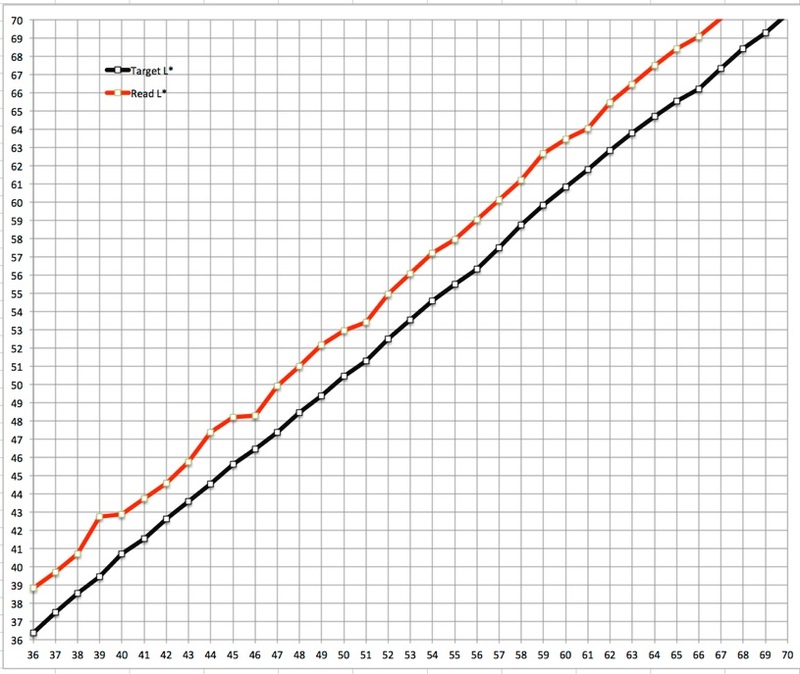 However, it failed its accuracy test badly (Figure 46) with an average dE(2000) of 5.7, worst patch over 10. When seeing results this far from normal, one should suspect some kind of procedural error, but on reviewing the procedure, and re-doing it twice over, which is the same as for every other profile testing routine used in this article, I couldn’t detect any. I did notice in SilverFast prior to scanning the test target that the selection of the X-Rite generated profile brightened-up the test image quite a bit relative to its appearance with the profiles that produced better results. As well, examining the underside of the 3D view of this profile’s gamut projection shows possible malformation in the dark tones (Figure 47). Both observations suggest the problem is likely with the profile. Therefore, to be fair to the X-Rite option, I did a retest. I remade the profile, but instead of using the profile resulting from the convoluted procedure described in the V850 review, I now scanned the X-Rite target in SilverFast (all colour management i.e. CMS Preferences turned off) and made the profile with the scanner profiling function of i1Profiler version 1.7.1 (most recent X-Rite professional profiling software). I then ran the accuracy test using the HCT target as the test media. The outcome was an improved profile shape and improved dE(2000) of 2.36 (Figure 48), with the worst patch having a dE of 9.6. This is still less accurate than results achieved with the SilverFast process, and somewhat more time-consuming. 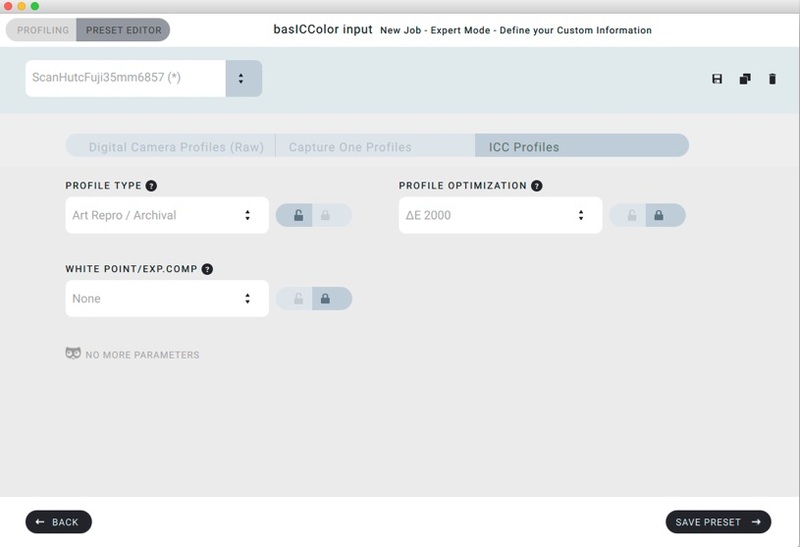 Turning to a more promising alternative, basICColor provides an application named “basICColor Input 5” (BCI), which makes both scanner and camera profiles. 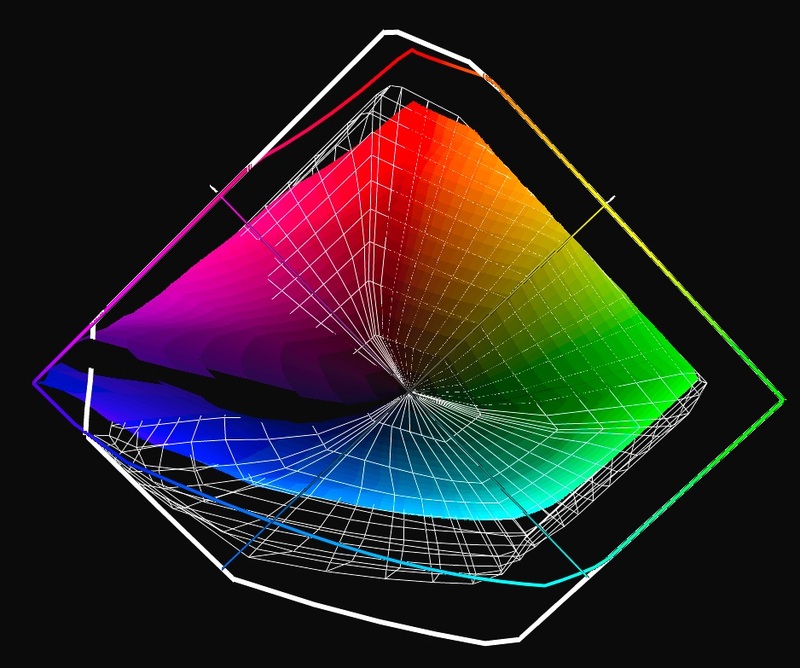 (basICColor is a major developer of colour-management software, located in Germany; their products are used in many institutions around the world.) Unlike SilverFast, it doesn’t come bundled with scanners or scanning applications, so this is a stand-alone license purchase of 500 EURO, but once licensed for personal use, one can build scanner and digital camera profiles for any number of devices one owns and using a variety of targets. Many museums around the world use it for their digital archiving. BCI builds and verifies profiles. In addition to the BCI license one also needs to buy a good scanner target. And one also needs a scanning application for scanning the target with colour management settings that allow colour management and all other editing to be turned off. I discuss all that below. The two main sources of third-party scanner targets these days are Hutchcolor and Wolf Faust. For 35mm targets, the Faust IT8.7 target typically costs USD 35 plus shipping, while the Hutchcolor 35mm batch-measured target costs USD 242, and the 6*7cm hand-measured target is USD 547. Hutchcolor, whether batch or hand- measured, has far more patches and a more elaborate design versus the IT8. I have not used a Faust target, so I don’t know the difference of outcomes one should expect with a Faust IT8 versus either of the Hutchcolor targets. That could be another story for another day. I do have a Hutchcolor target (HCT, Figure 44), so I put it to work with BCI. A. Adjust (if needed) a “preset” for the profiling target being used to create the profile. It is necessary to use a profiling target that is listed in the BCI preset menu. The Hutchcolor target is one of those listed. There are also IT8.7.2 target prototypes for Agfa and Kodak. I do not know whether they work for the Faust target. Most important for using a preset is to make sure the correct reference file is associated with the target. When you buy the target, it identifies which reference file you need to transfer either from an accompanying CD-ROM or download and install from the provider’s website. B. Scan the target in SilverFast (or other scanning applications that permit disabling colour management, all editing and sharpening) and save the scan as a TIFF file. C. Load the TIFF file into BCI by dragging it onto the profiling window having the right preset selected. Click “Start Profiling”. The application makes the profile and stores it in your User Profiles folder. Relevant to Mac OSX (perhaps also Windows, I don’t know), store a copy in the System Profiles folder just in case your scanner software doesn’t deal with the User profiles folder. This is quite an easy set of steps to implement, as the application is fairly intuitive, with a nicely designed GUI and on the whole, user-friendly. As many people, especially in North America, may not be familiar with this European software, I provide here a more detailed elaboration of the four basic steps mentioned just above. 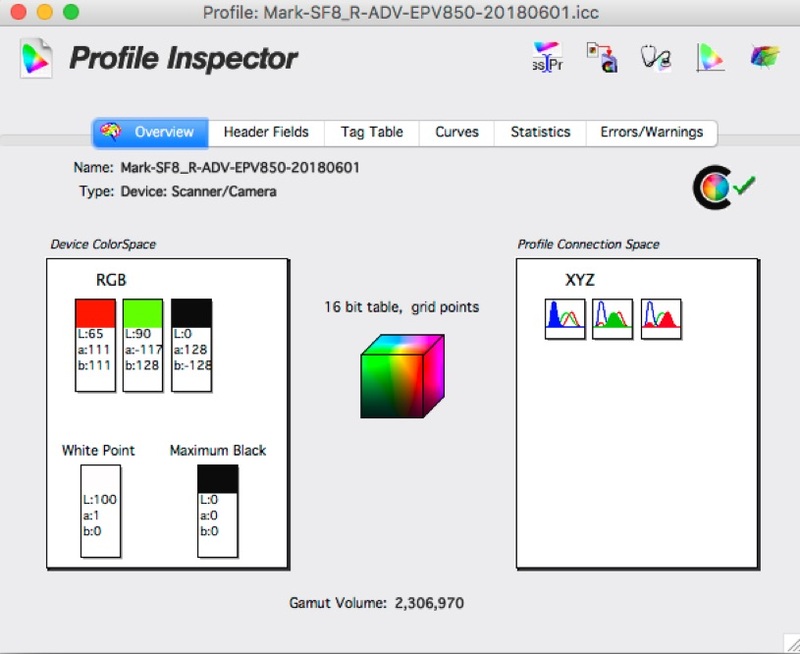 Upon opening BCI skip the tutorial page (unless you want to see the tutorial) and the profiling interface opens (Figure 49). 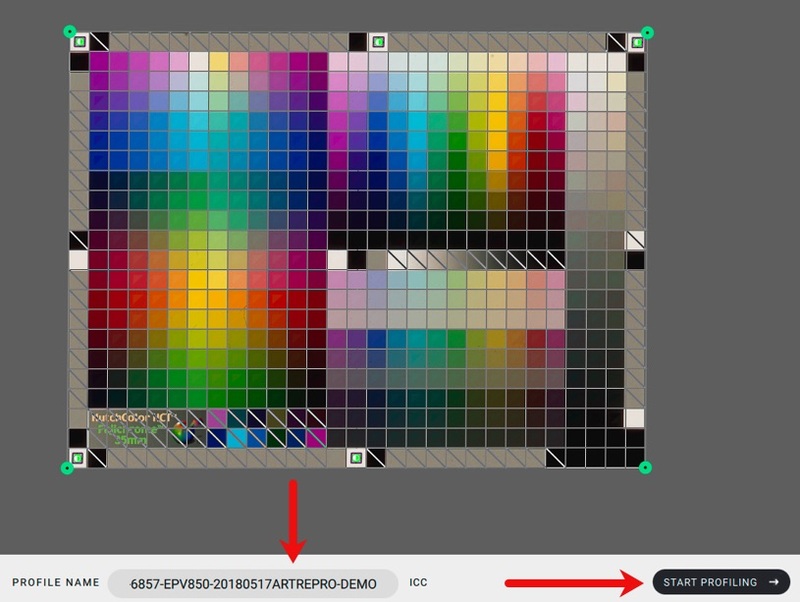 If you need to edit the Preset, open the tab “Preset Editor” (Figure 50). Select the target for the new preset (Figure 51). 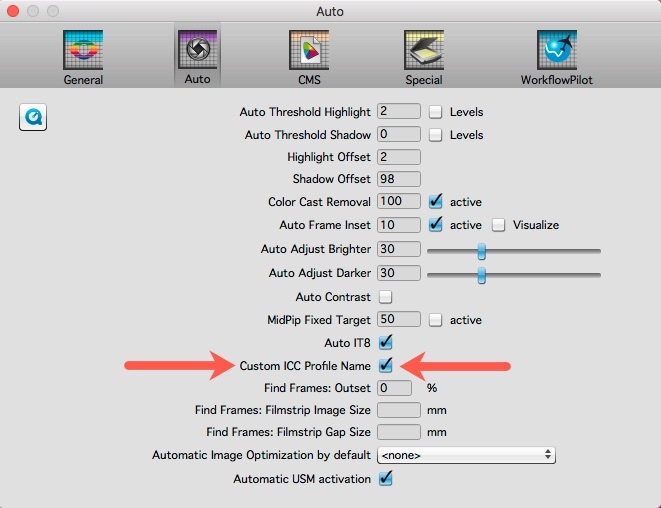 Go into Preset Options Expert Mode (Figure 52) and select from presented options according to how you want the profile made. For the <Profile Type>, use the Art-Repro mode, not the Scanner mode, even though one is profiling a scanner. The Scanner mode is in the application for some legacy purposes, but the Art Repro mode produces higher quality profiles according to the primary BCI developer. Under <Illuminants>, there is a wide variety of illuminant types from which to select, using the drop-down menu and fly-out lists. I have retained the default D50. For <White Point>, choices depend on the task type, there being an “Auto” option, which is the one I use for non-specialized photos. For <Profile Optimization> one may choose between dE2000, dE 2000L, dE76, dE94. 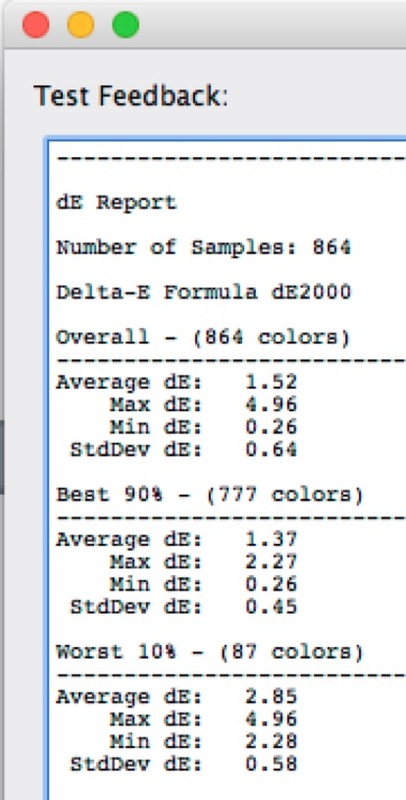 Because it is the most frequently advised these days, I have selected dE2000 here and used dE2000 as the metric for reporting profile quality test results. For <Observer>, there is a choice of 2 or 10 degrees. I have remained with the default 2 degrees as it is said to be the most suitable for quality control and colour evaluation procedures. Select the appropriate Reference File for this target (Figures 53, 54), save the preset with a recognizable name and it becomes the selected one on opening the application. Revert to the “Profiling” tab. 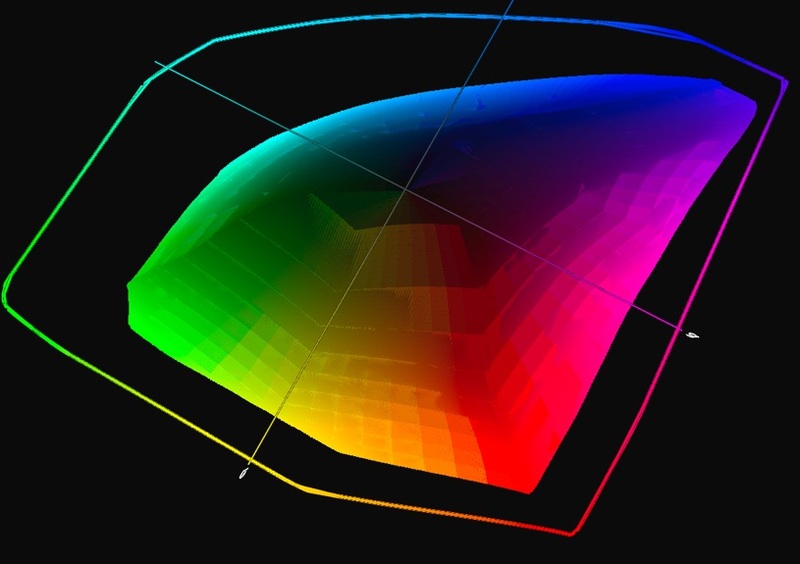 The three most important abilities needed to optimize the scan of a profiling target using this approach are to (i) disable colour management, (ii) disable sharpening and all other editing adjustments when scanning the profiling target, and (iii) select a scan Gamma. SilverFast provides for all of this and is the scanning application I use – not to say that other scanning applications can’t do likewise. 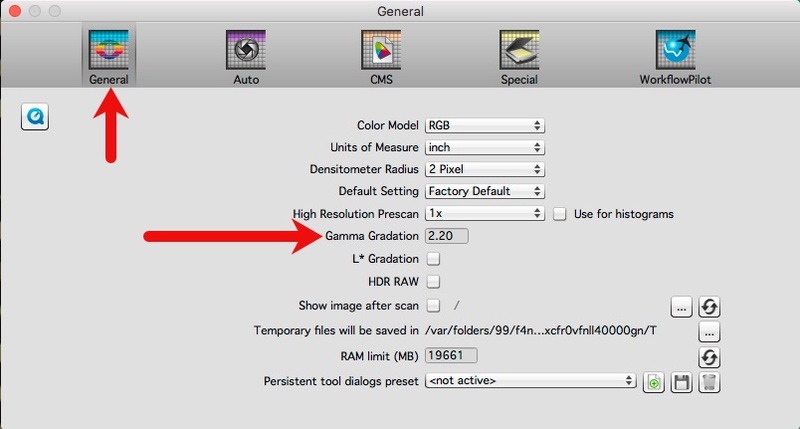 Scan Gamma is controlled in SilverFast Preferences>General. For the time being, I am leaving it at the default 2.2, but I shall change it later. This is one of the key creative options in scanner profiling, as we’ll discover below. 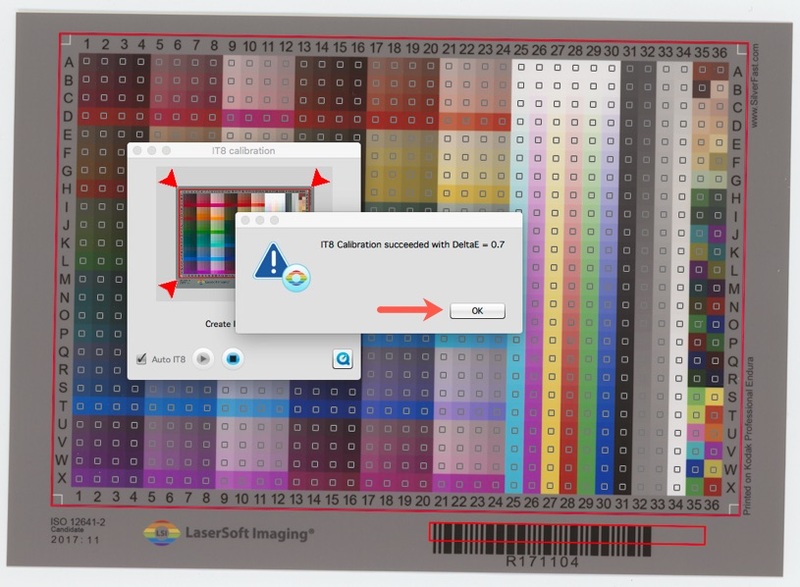 Unlike for the SilverFast Auto IT8 procedure which automatically controls colour management options, people deploying user-controlled profile generation need to make sure that color management of the target scan is disabled. The place to do this in SilverFast is <Preferences>CMS>. I think the design of this interface could be beneficially simplified and contains several “features” I would consider worthwhile rethinking, but we won’t divert into all that here. 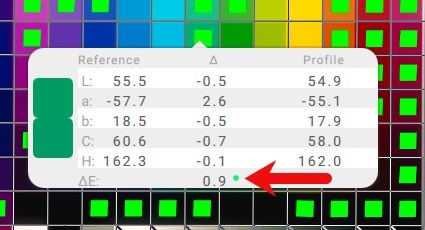 The important information needed to turn off colour management for creating a scanner profile is in Figure 55; it’s pretty straightforward, it is the only set of options one should use for this purpose and it works: just use the dropdowns to make the appropriate selections. 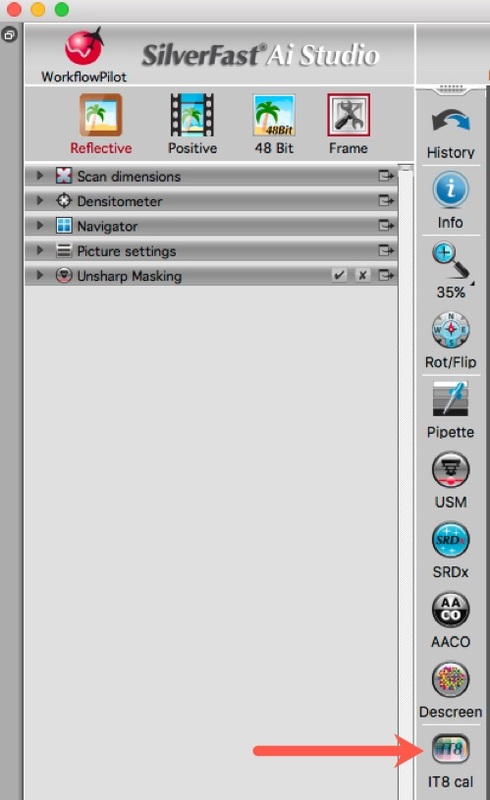 The other SilverFast settings needed to scan a 35mm target are on the left side of the main interface (Figure 56.). Scan resolution should range between 300 and 1200 PPI for large to small targets respectively; set bit depth to 48. The point is that we don’t need a large image file for profiling. My profiling images are in the range of 6 to 7 MB, and they could probably be smaller without harm. 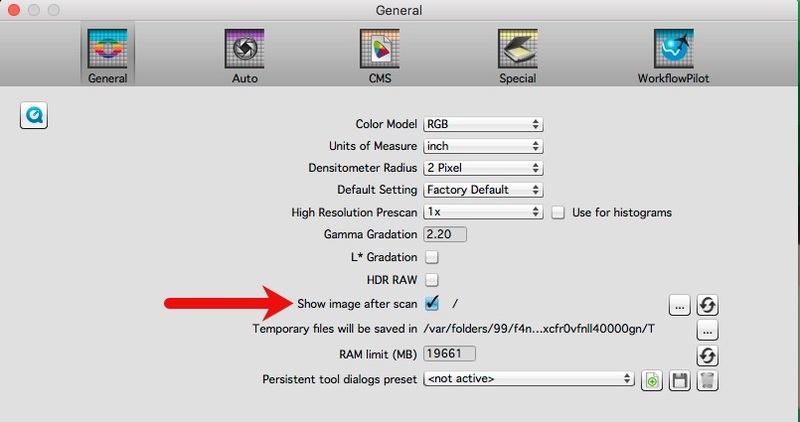 In SilverFast Preferences>General you can (and should) elect to “Show Image After Scan” (Figure 57). 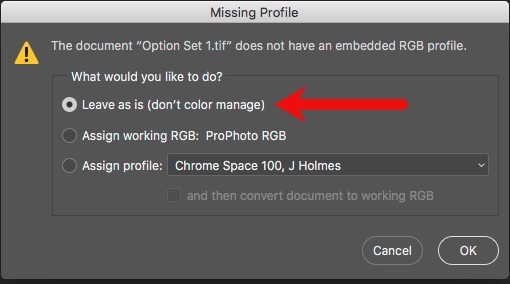 If Photoshop is your default application for opening TIFF images, when the image opens in Photoshop and you’ve had your colour management warnings in Photoshop turned on (as you should), you will get a “missing profile” warning (good!). Select the option to “Leave As Is”, i.e. do not colour manage the image (Figure 58). Once the image opens in Photoshop, do nothing with it (for now) except to clean-up any blemishes carefully with the clone stamp, making sure not to contaminate any patch with colour from a neighboring patch. Save and quit. The image of the profiling target is now ready to import into BCI for creating the profile. Drag the profiling target image (Hutchcolor in this case) onto the profiling interface having the right preset (Figure 59). Place the grid correctly over the patches (Figures 60, 61). Name the profile and click on “Start Profiling” (Figure 62). You will see a progress bar tracking the progress of the profile creation calculations (Figure 63). 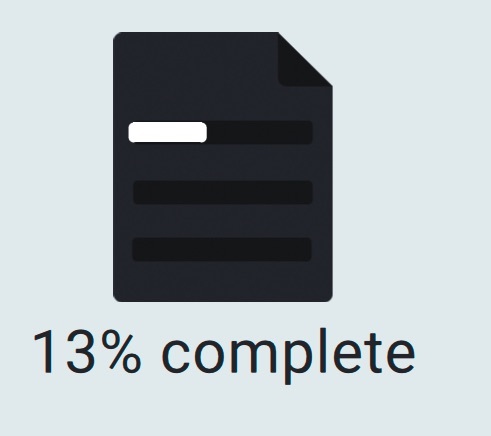 When completed, a completion notice appears (Figure (64). This can take a while. After clicking “OK” on the completion notice (Figure 64, red arrow), the first quality control (QC) tool appears (Figure 65, horizontal red arrow). 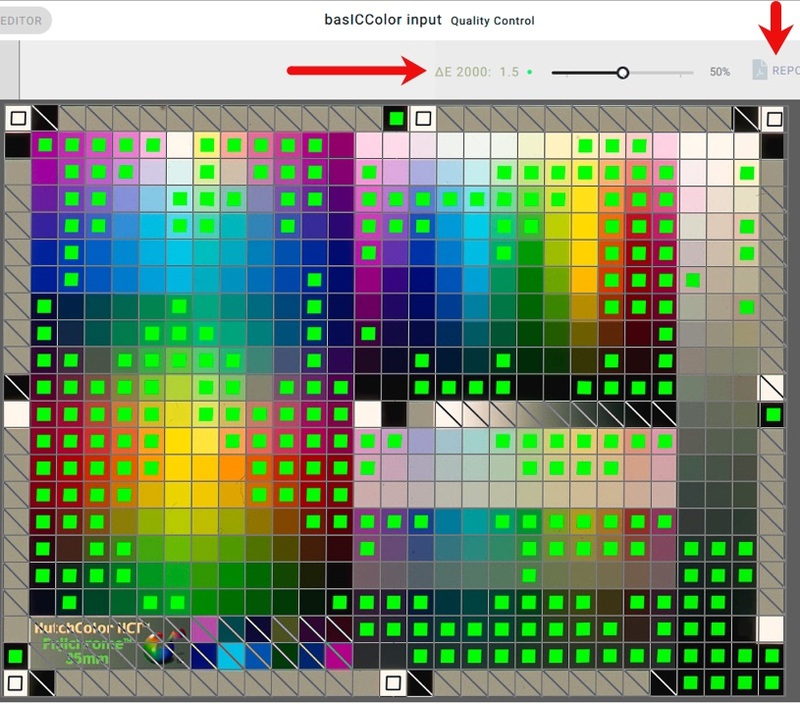 With this tool, you see for example that at the 50th percentile of the patches, the dE(2000) is 1.5 and the green squares in Figure 65 are at or below dE 1.5. If you move the slider to 100%, you will see the dE of the patch with the highest dE. 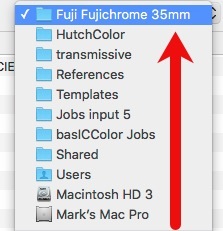 The profile is stored in your User>Library>Colorsync>Profiles folder (OSX). If satisfied with the profile, place a copy into the System Profiles folder for use in any scanning applications that only access scanner profiles in that location. If you click on the “Report” button (Figure 65, vertical red arrow, top far right), a full report is generated in PDF format. From the header, you can read summary data for the profile (Figure 66), followed by a list of dE results by channel for each patch in the profiling target. Back in the BCI interface, you can hover over any patch with your cursor and see a detailed report of its dE (Figure 67). This is all really slick and useful for detailed diagnostics. Results from using BCI by following this procedure turned out to be good on the whole, based on the Reflective and Transmissive test profiles I created in BCI. Using the SilverFast Reflective target (Advanced) as both the test media for building the profile as well as testing its quality, yielded the following result from within BCI (Figure 68). 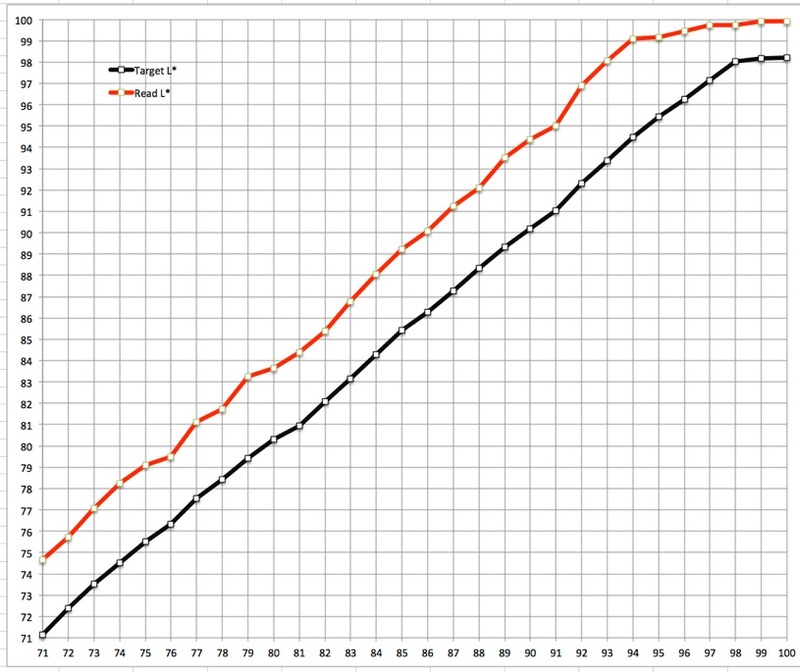 The average dE is 1.48, the worst patch having dE 2.99 and Standard Deviation of only 0.61. This is a fine result. 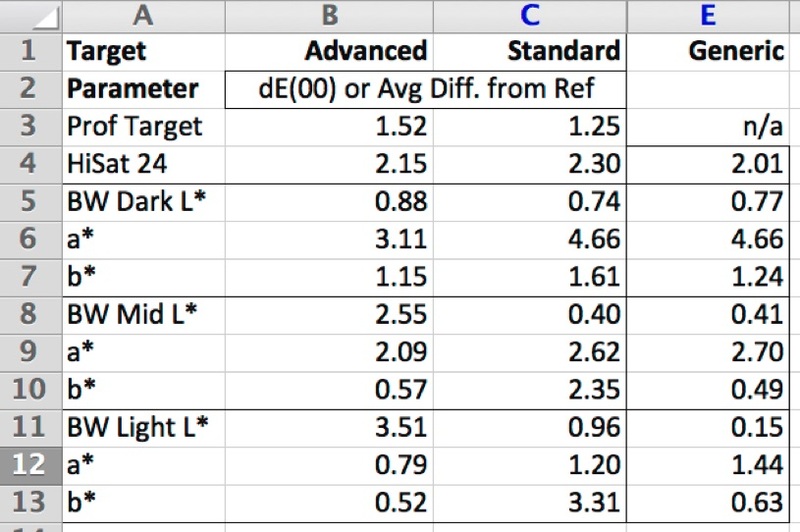 Doing the externally-generated round-trip test using CTP (Figure 69) by rescanning the profiling target, the Average dE came out at 1.51, the worst dE being 5.75 and the Standard Deviation of 0.66. These results are close to the internal Quality report produced in BCI. The performance verification for my Neutral scale targets (3 sheets, L*1 to L*100) showed mixed results (Figures 70, 71 and 72 for the Dark, Mid and Light tones respectively). 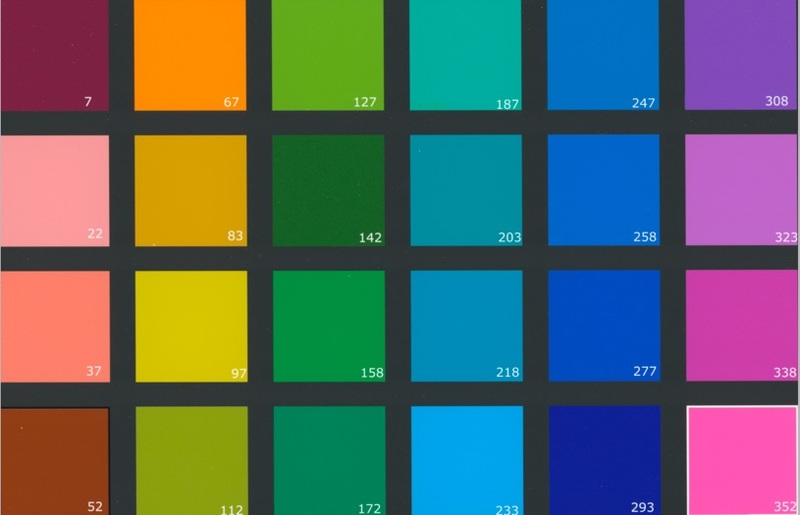 The Luminance outcomes are on the whole good, however, some of the hue bias could be better. The interesting point to be made about this, however, is that the worst hue bias occurs in the darkest tones where it is hardly visible, and correctable in post-scan editing. Perhaps also relevant to the convergence (or not) between perceptual and statistical accuracy, while these profiles are optimized for dE2000, the measurements in the three Figures below are more akin to dE(76) – numerical differences unadjusted for non-linearity of human visual perception. 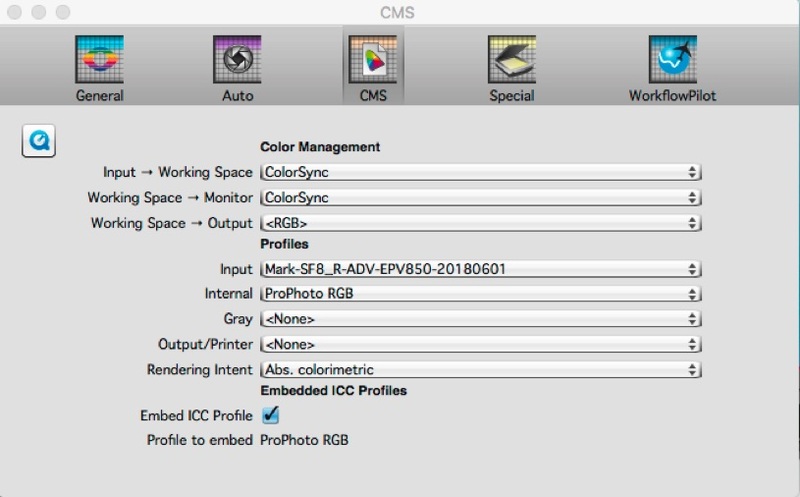 Concerning the dark tone ramp in Figure 70, there are generally two main ways of colour-managing a scan: (A) assign the scanner profile and select the working space in the scanning application (if it is colour-management aware), or (B) send a completely unmanaged scan to a post-scan image editing application, such as Photoshop, and assign the scanner profile and convert to working space there. Normally, one expects these two approaches to yield identical results, but occasionally they don’t (why I have no idea). 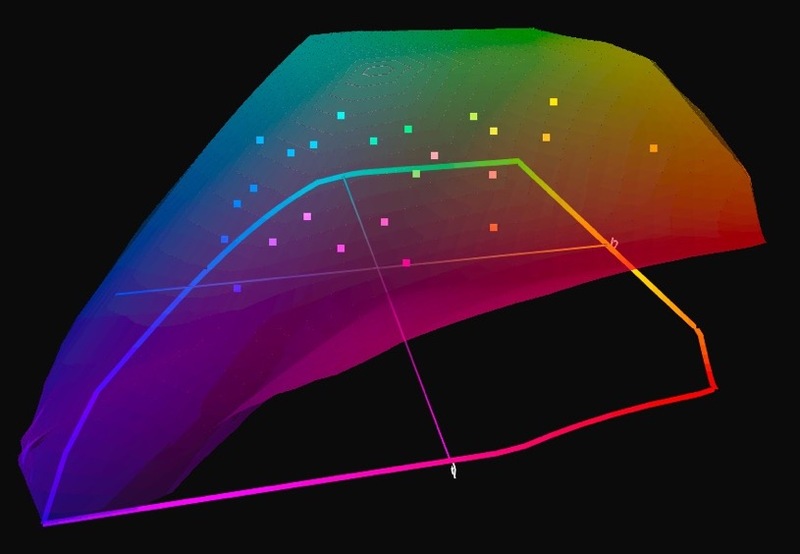 For all colour-managed scanning in this article I have been doing (A), but to get a roughly correct luminance curve with the BCI5 profile in the dark tones only, I needed to implement (B). This is just to suggest that if you are working with these procedures and aren’t satisfied with the result from one, it could be worthwhile trying the other. The test using the 24 highly-saturated colour patch target yielded an average dE(2000) of 2.95, the minimum being 0.85 and the maximum 6.6. 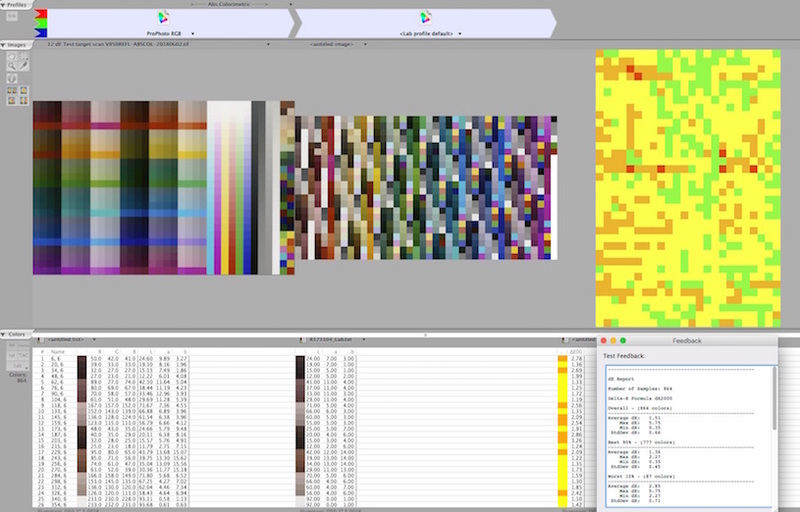 Turning to Transmissive profiling in BCI, I made a profile from a Hutchcolor 6×7 cm. target, then rescanned the target with that profile. I examined the BCI quality control report, and also compared the result with the target reference file in CTP. The internal Quality Control report in BCI showed the profile to have an average dE of 1.73, worst patch dE 4.99 and Standard deviation of 1.15 (Figure 73). The results from external testing with CTP are quite similar (Figure 74) with Average dE of 1.93, highest dE 5.60 (one patch) and Standard Deviation of 1.17. Both results indicate a very good profile. I’ve mentioned that we can and should deviate from the objective of profiling accuracy if our main objective is to create profiles directed at solving certain problems where accuracy is not the most critical issue, in particular, blocked-up shadows which are so common with many of our 35mm transparencies. I’ll call them “adjusted profiles”. What I’m about to show here works very well provided the detail exists in the media, but just isn’t showing through by making scans using profiles embedding the standard parameters worked with above. Before getting into it, I should advise that everything I say about this is not recommended “vanilla” profiling – it is being creative with the process to achieve defined objectives. The basic principle behind the creation of adjusted profiles is that we are going to fool the profile into believing that the scanner behaves in the opposite manner to how we wish to see the results of the scanning; in this way the profile will help correct for this pseudo behaviour, ending-up with outcomes more to our liking. For example, if the correct outcome is brighter dark tones, we darken the profiling target scan so that the eventual profile believes the scanner is producing tones that are too dark relative to the target reference values, whereupon the profile helps push them up and provides brighter scans than otherwise obtained. The way we do this is to amend the profiling target image scan before committing this image to the profiling process. There are different ways of going about this, but my preferred approach for overall ease of implementation is to begin by varying the Gamma setting for the target scan in SilverFast General Preferences (Figure 75). There is a large literature on gamma but boiling it down to only what we need to know here, the equation that defines the tonal relationship between luminance inputs to an imaging process and the resulting luminance outputs is: Output = (Input)^gamma (Output is Input raised to the power of gamma). If the overall gamma of an imaging system is 1.0, its output is linearly proportional to its input. This means that the ratio between the luminance intensities of any two areas in the reproduced image will be the same as it was in the original. However, human visual perception is not linear. A gamma value of 2.2 is widely considered to represent how, on the whole, humans generally perceive what looks like natural tone relationships in photographs. Lower gamma values produce flatter darker images and higher gamma values more contrasted, brighter ones. Figure 76 shows a comparison of three gamma settings, to illustrate the effects. 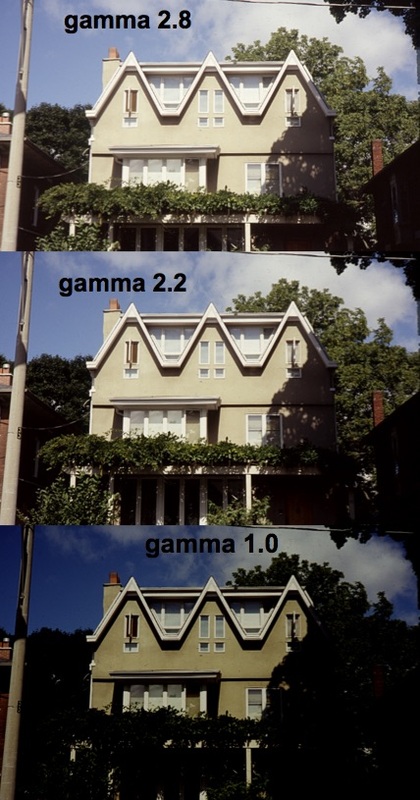 Notice how the middle one, gamma 2.2 looks the most natural, but shadow detail is still blocked up, while gamma 2.8 blows highlights and gamma 1.0 is just way too dark overall. Hence, if we were trying to create a more open and flatter scan than obtained at gamma 2.2, we would test gamma values below 2.2, scan the target at those values regardless that they make the target scan look “too dark”, make profiles from the targets and apply them to candidate images that have useful appearance properties for showing the differences between the various gamma settings. When we do this, the resulting scans will produce brighter images. The impact of this brightening could under-differentiate highlight detail, so to protect highlights we may wish to “gild the lily” by opening the target into Photoshop, leaving it “non-managed”, and apply a lock-down tone curve to increase only the highlight values without clipping them, so that the profile image will make-believe the scanner is exaggerating highlights that need to be toned down with the help of the profile in the final result. This is not a one-size-fits-all procedure. The most appropriate gamma and other tone amendments to use would vary according to the scanner, the film stock and the general character of the problems being addressed. Just remember that whatever you adjust in the profiling target image, it should be opposite to the outcome you are looking for. It may well be useful to make several profiles at different gamma settings to have them on hand for several generically different but commonly reoccurring imaging problems to warrant making the initial big-scale adjustment via the profile rather than doing everything file-by-file in post-scan editing. 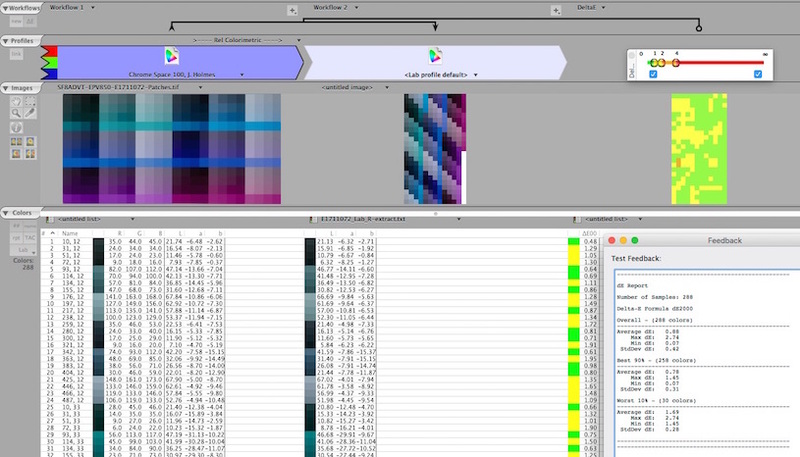 I should also remind that it is especially for this kind of “tinkering” that a manual profiling procedure working between applications (such as SilverFast, Photoshop and basICColor Input) becomes so useful, as all the key settings are “above the hood” at user discretion. In the example below, which is typical of many blocked-up shadow problems, I’m satisfied that the photo with opened shadows and duller highlights emerging from this adjusted profile scanning will look somewhat flat, because this is very easy to custom-correct in Photoshop or Lightroom, usually with a simple tone-curve edit. I would be less satisfied with the opposite problem (excessive contrast with blocked- up shadows and highlights), because that is more difficult to contend with satisfactorily in post-scan editing. After testing a range of gamma settings from gamma 2.6 down to 1.4 on one of my most troublesome but revealing slides from 1958 in respect of pulling out shadow detail while protecting highlights, I decided that gamma 1.6 for making the profiling target image worked best. I also tested this profile on a range of photographs all having different degrees of shadow and highlight properties and decided that whenever I come across blocked shadow issues I would revert to my custom gamma 1.6 in the first instance and give it a try. 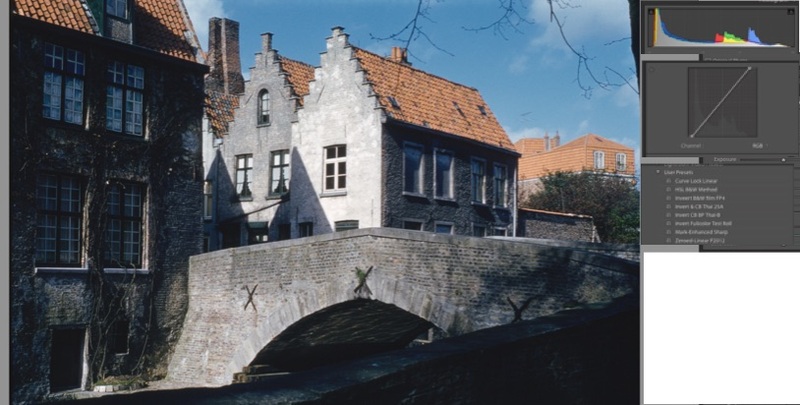 The “reference” digital version of this photo is the camera scan I made of it with my Sony a6000 camera-scanning set-up, then imported to Lightroom for minor tone curve and color balance edits to produce what it “should” look like on a bright Spring day in Bruges way back then (remember I said we are into visual perception here…Figure 77). Please notice in particular the shadow detail of the vines on the left wall of the building, and the reflections of water off the underside of the bridge. Also, glance at the highlight areas – clouds and the sunlit buildings from center back to the right. The default Epson V850 scan made with my custom profile from the Hutchcolor target at gamma 2.2 looks as shown in Figure 78. 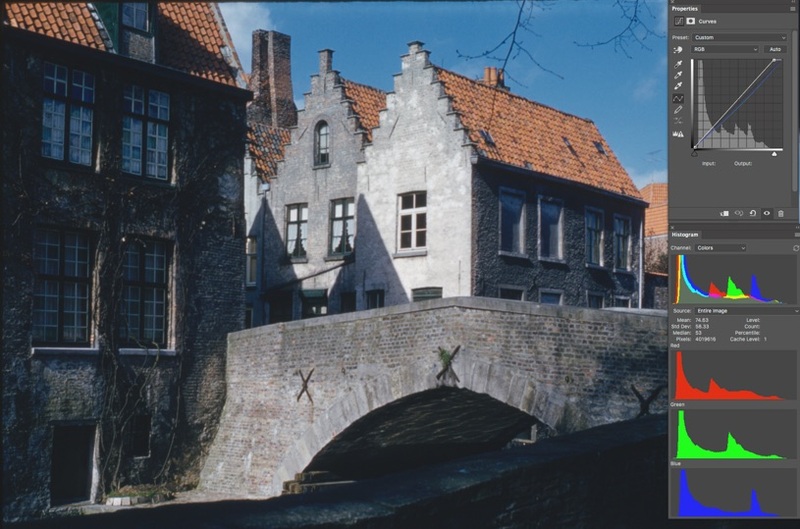 Forget about the bluish hue bias for now – easily correctable with a click of the eyedropper against the light grey building behind the bridge in Lightroom – but notice how blocked-up the shadows are on the left building wall and under the bridge, and correspondingly, how tones are bunched-up to the dark side of the image’s histogram. It is possible to rescue the shadows somewhat by applying a lock-down curve and adjusting from the shadows upward, but it is finicky and time-consuming to achieve good tonality across the photo. So, I revert to the 1.6 gamma profile. 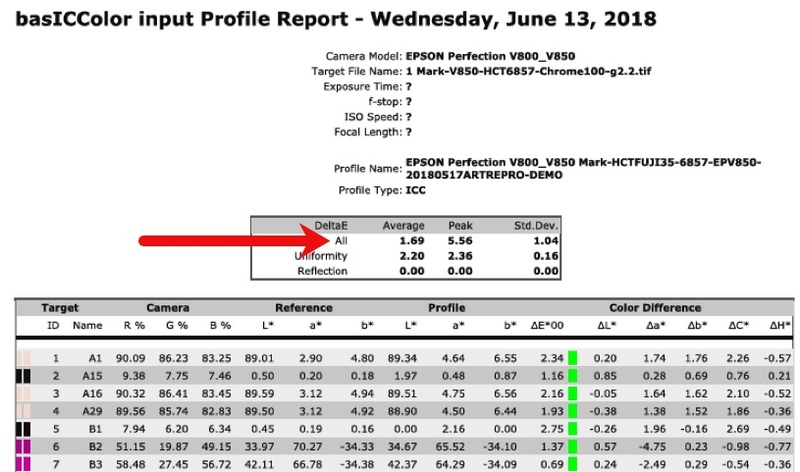 I made the gamma 1.6 profile for the Epson V850 with the Hutchcolor target (Figure 79), and also applied highlight brightening to the profiling target scan using a 10- point lock-down curve as discussed above, adjusted only to strengthen the highlights without clipping (see the histogram). The black box on the top shows many of the highlight patches in the target that become toned down when the Curves adjustment is turned off (but we want it on – remember the principle – desired adjustments are reversed). Compare also the right sides of the two histograms. The unadjusted scan made with the gamma 1.6 profile shows how well-opened and visible the shadow detail becomes (Figure 80) with the highlight detail preserved, but the result is rather flat, needing some “upbeat and sunshine”; it also has a bluish cast (this is on account of the slide, not the profile). To fix all that, I took the scanned photo into Lightroom and did two things only: (i) applied the eyedropper on what I judged to be the grayest spot on the gray building just behind the bridge, which rebalanced all the colours nicely in a click; (ii) I used the tone curve in its linear form to increase contrast without clipping either highlights or shadows. The detail of both shadows and highlights is very good (Figure 81). If you compare this rendition with that from the camera scan above, you will see that while I haven’t made them identical, they aren’t far apart. Finally, you may have noted I mentioned this photo was made with Kodachrome, while the profiling target is on Fuji media and the profile is not specified for correcting Kodachrome. At least the early vintages of Kodachrome were manufactured to have a cool cast so that when the slides were projected using projectors with warm bulbs, the colours on the screen would look natural. We don’t want or need that in digital imaging. Nonetheless, the gamma 1.6 profile provides a very useful base from which to make the minor adjustments that correct for the Kodachrome cast. In Lightroom, Figure 81, I did this simply by clicking on a decidedly gray spot in the photo. Another approach is to do it manually in Photoshop. In Figure 82, you can see the result of applying a reduction of the mid-tone green curve to back-off green about 4 levels, and a reduction of the Blue curve to back-off blue about 4 levels. Then a Hue- Saturation layer to increase saturation to +12, and the photo is done. 1. SilverFast’s Advanced profiling targets and the IT8Cal process in SilverFast 8 Ai produce quality profiles, effortlessly, in a jiffy. 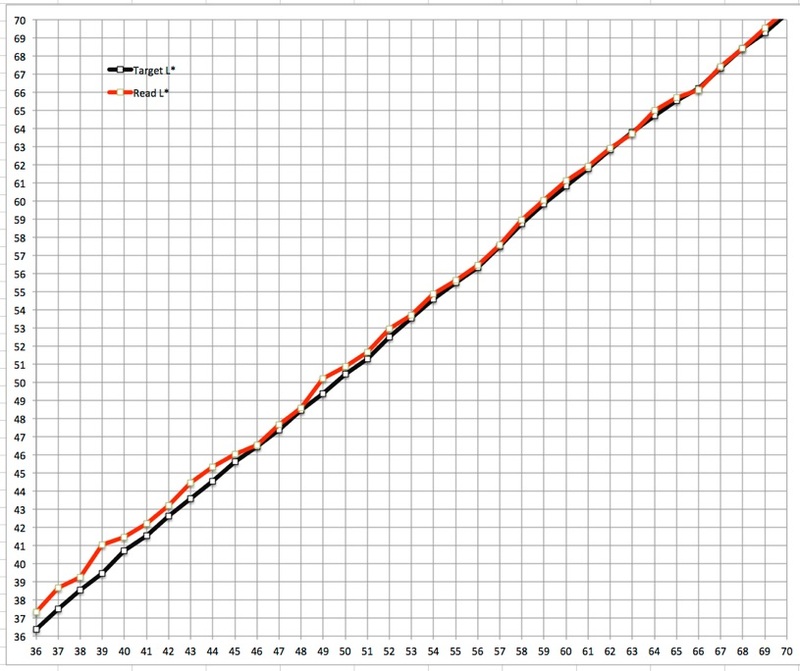 On the whole, the Advanced targets improve accuracy relative to the older IT8 targets. People who already own SilverFast Ai or are upgrading to it only need to purchase a target or two (reflective, transmissive) and they have a complete in-built effective scanner profiling solution ready at hand. No other software or materials are required. 2. 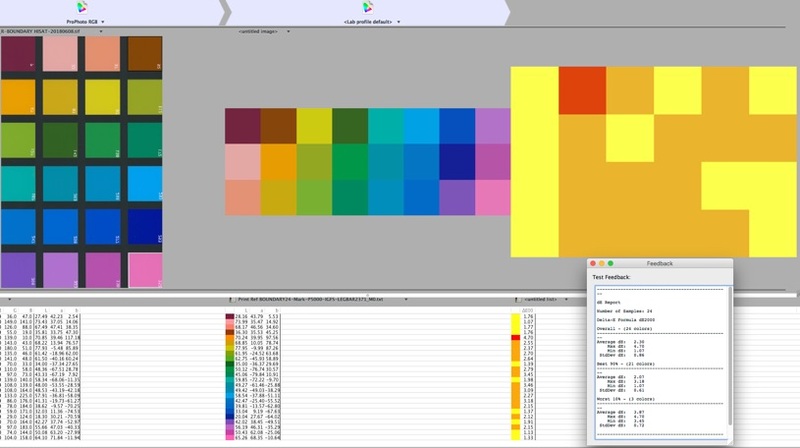 People who want to exercise control over profiling aimed at resolving specific generic problem issues in their media, or who want profiling software with more options in respect of devices, targets and settings may find a more hands-on manual approach to profiling particularly useful, and for this category of users, basICColor Input 5 is a serious option. 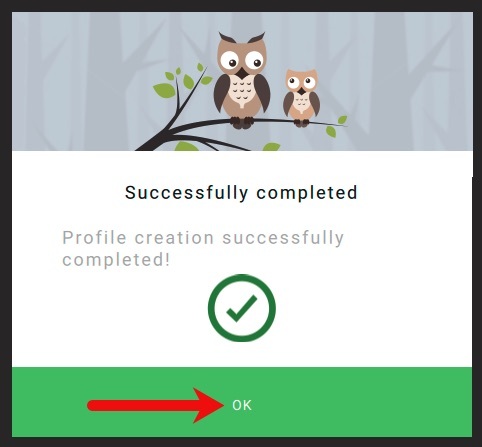 The profiling process is straightforward to implement, the user interface is well-designed (though obviously more than a button push) and the quality of the resulting profiles is very good. 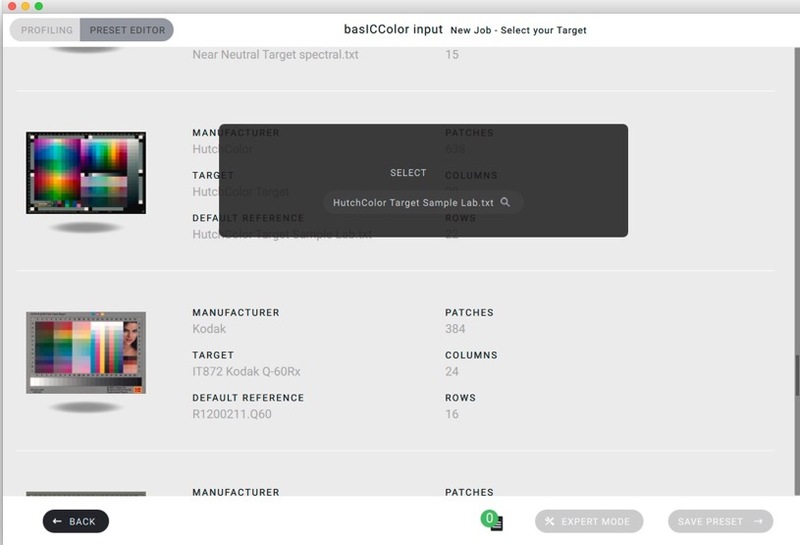 Those who wish to use the SilverFast Advanced targets in basICColor Input can do so by purchasing both. 3. 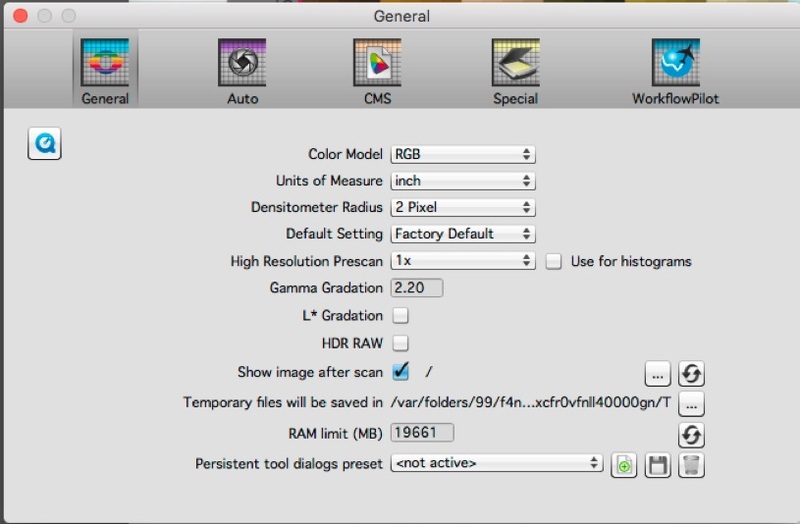 It can save time over the long term to experiment with gamma variants and tone curves in developing the target images for custom scanner profiles, as they can improve the starting point substantially for resolving some generic imaging issues, from which the finishing edits in Lightroom or Photoshop can be swift and easy. As a more general observation on strategy: one uses the profile to fix generic issues affecting a large number of photos, and reserve post-scan editing for touching up or custom adjustments that would vary a lot from one photo to the next. 4. There is no more Kodachrome available for making new targets to create profiles for scanning this film. One could create curves for correcting the hue bias in Kodachrome right in the profiling target images, but that is a bit trickier than what I’ve demonstrated above for dealing with Luminance issues; there were several versions of Kodachrome and, possibly, issues of processing consistency over time and between labs perhaps affecting universal accuracy of generic colour corrections – nonetheless it’s doable. Yes, all of this can dent your wallet a bit, but these days what doesn’t? Happy scanning! Many thanks to Franz Herbert, Vice-President of R&D, basICColor GmBH and Christopher Campbell, artist/photographer, USA. Franz provided important insight into the use of BCI and was kind enough to comment on a pre-publication draft of this article. Christopher and I worked together at the early stages of the research underlying this article, allowing me to benefit from his earlier experience using BCI, and was kind enough to comment on a pre-publication draft. I also had the benefit of very useful insights in discussion with Joseph Holmes concerning his Chrome Space 100 and other aspects of film scanning. LaserSoft Imaging also reviewed the pre-publication draft and provided their comment. I am, of course, solely responsible for how I used all of their input.